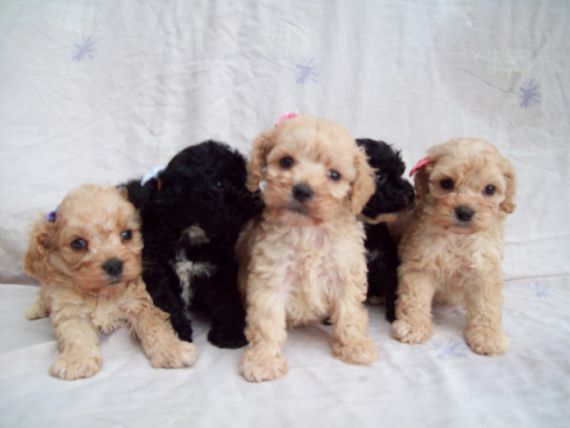 WE ARE BREEDING COCKAPOOS F1 AMERICAN AND ENGLISH SHOW TYPE X MINI OR TOY POODLE . 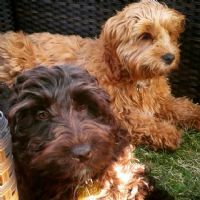 PANNI AND FAITH THE COCKAPOO WHO LIVE IN BUDAPEST. 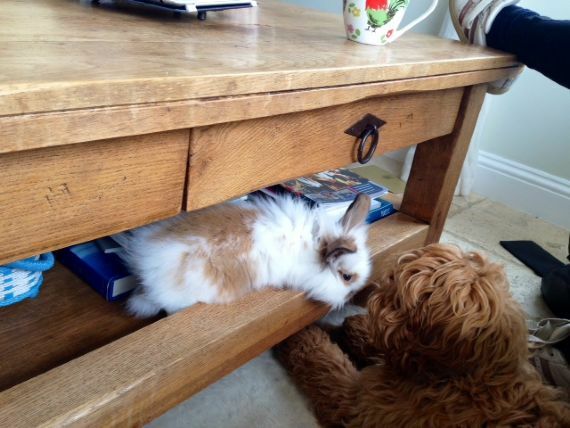 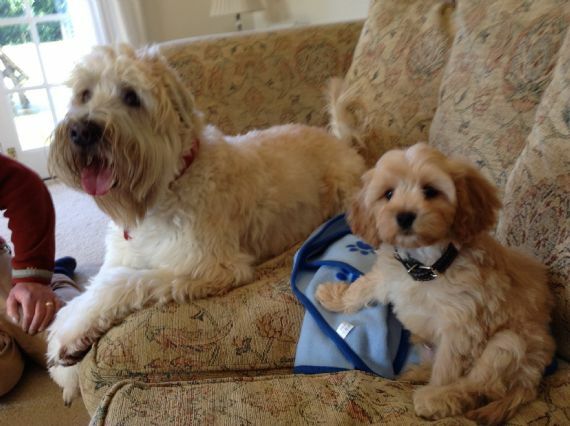 LOUIE AND NEW FRIEND . RAMONE AND HER NEW BABY . 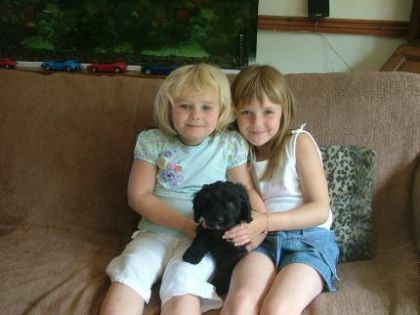 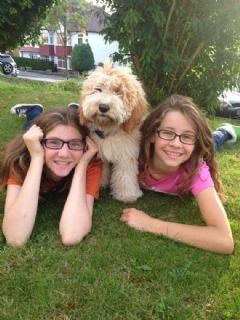 THE HARRIS FAMILY CAME TODAY AND COLLECTED ROSIE XXXHAVE FUN GIRLS!!! RAMONE AND HAPPY FAMILY . 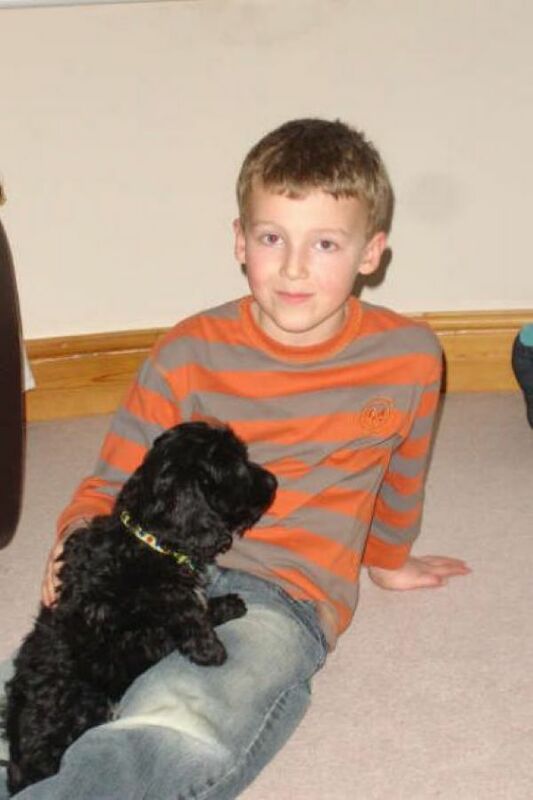 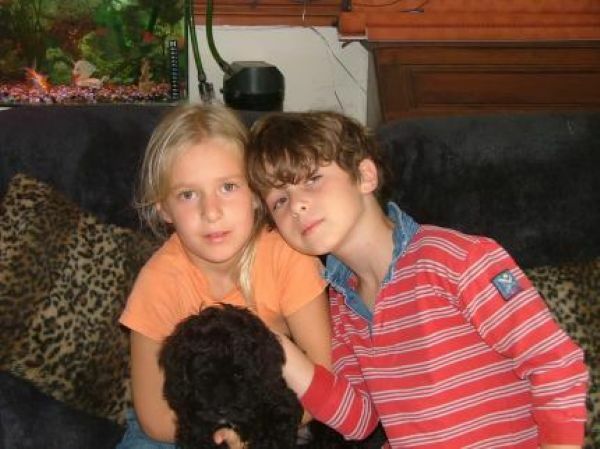 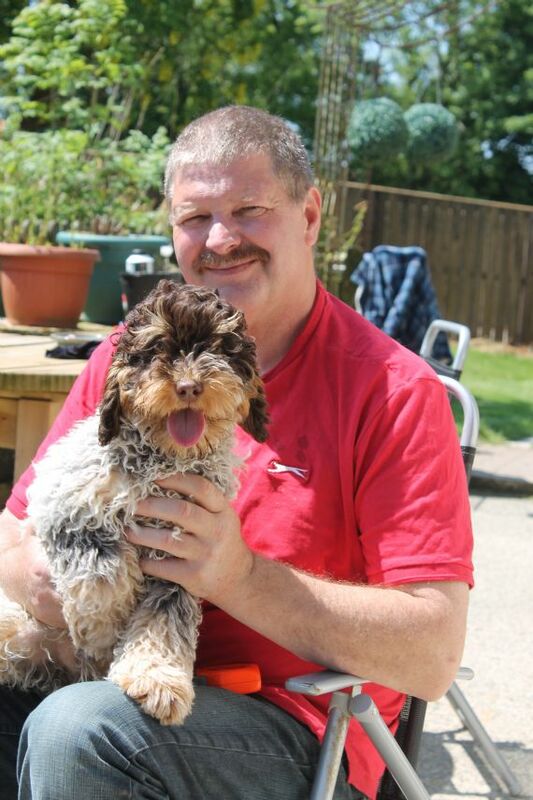 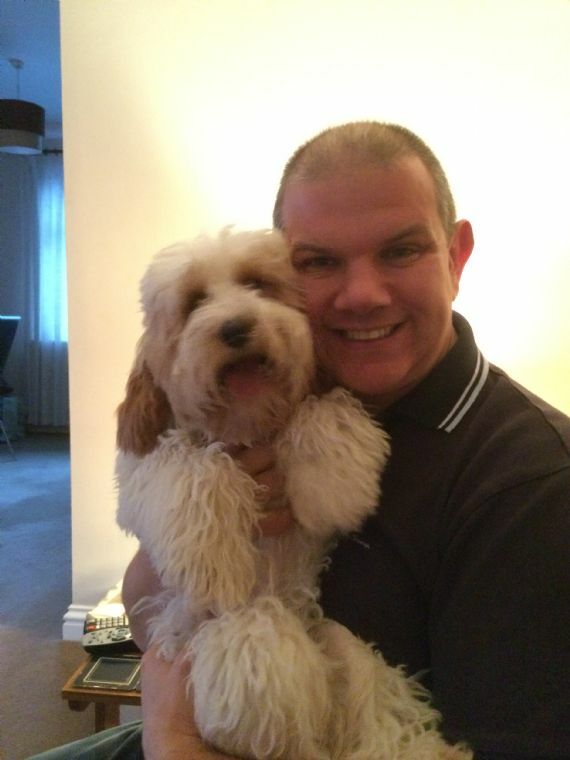 MICHAEL WITH PETUNIA , SHE IS GOING TO BE TRAINED AS A MEDICAL DETECTION DOG .... 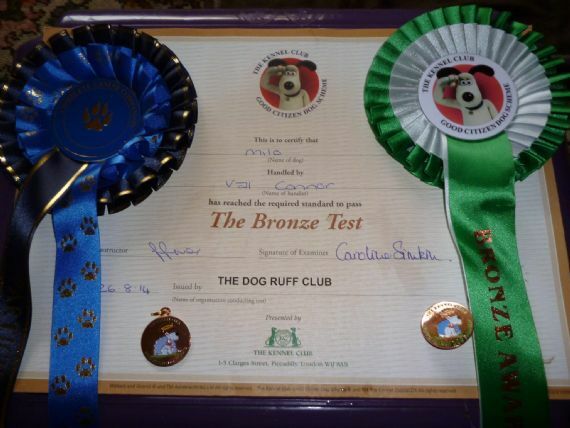 SO CHUFFED. 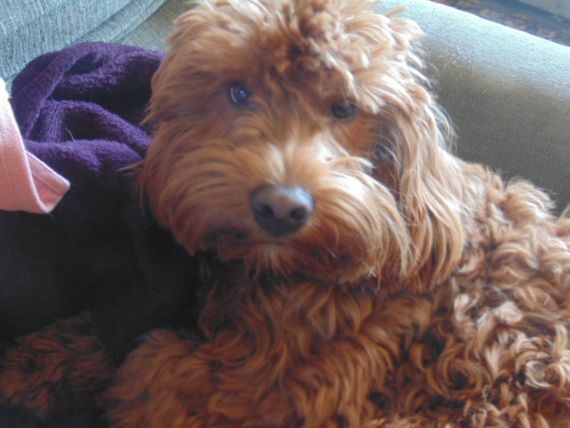 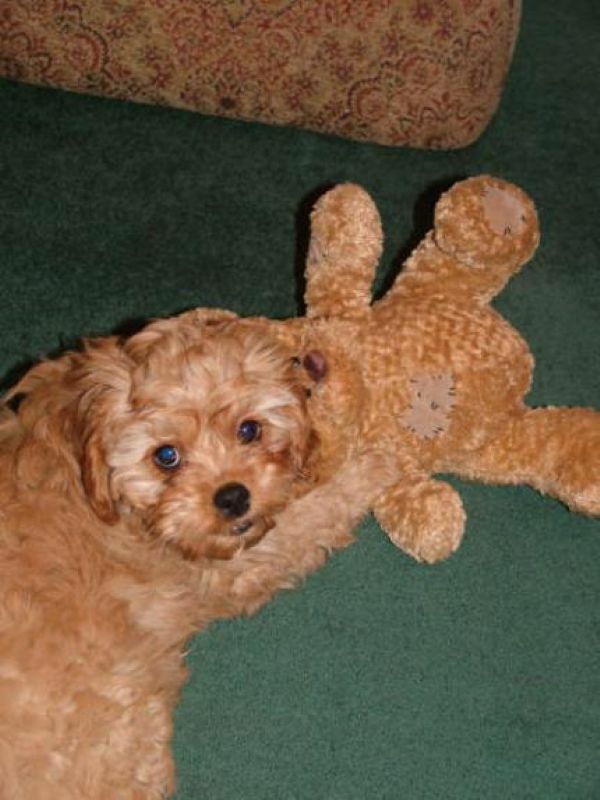 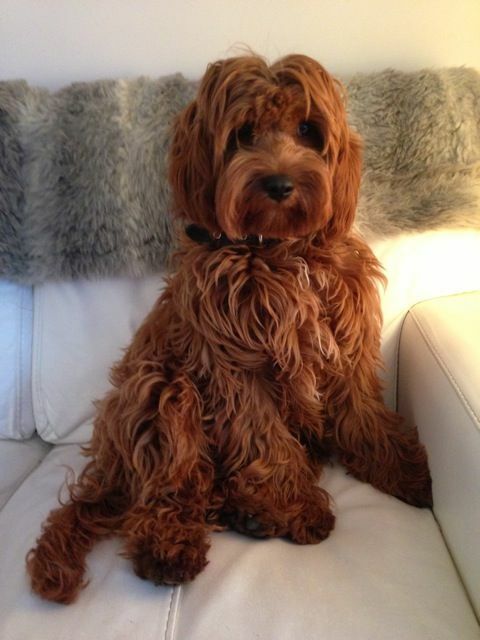 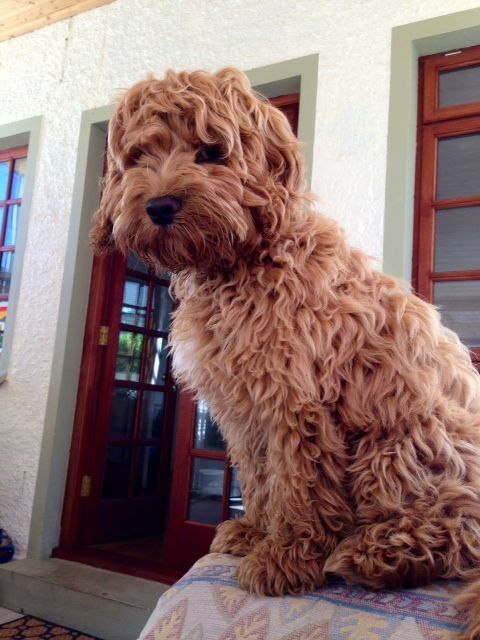 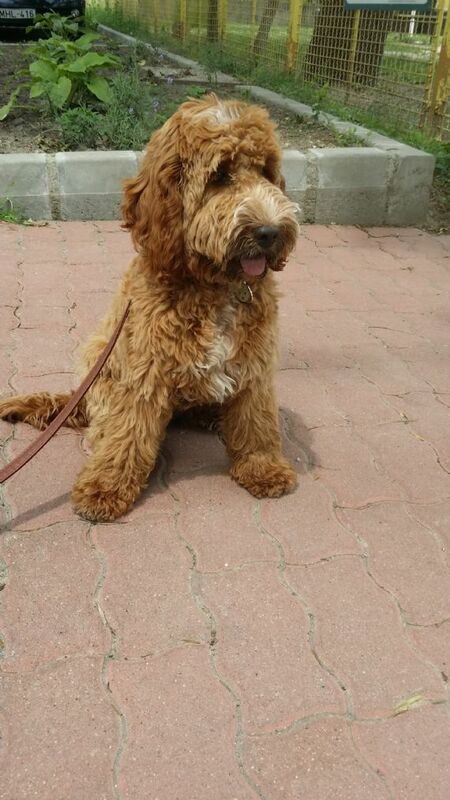 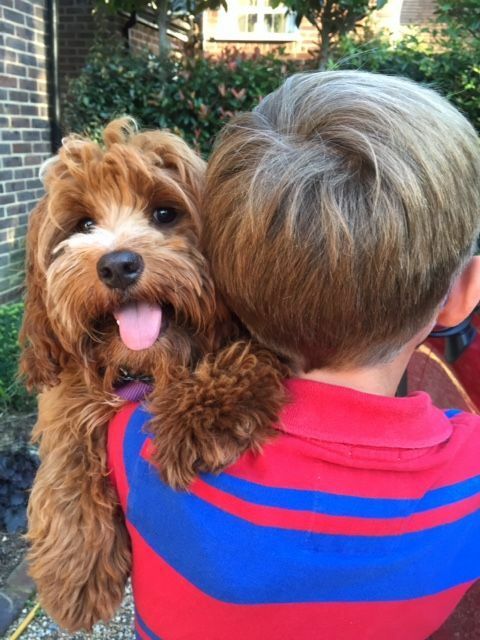 MY BEST FRIEND A JANDAZ COCKAPOO. 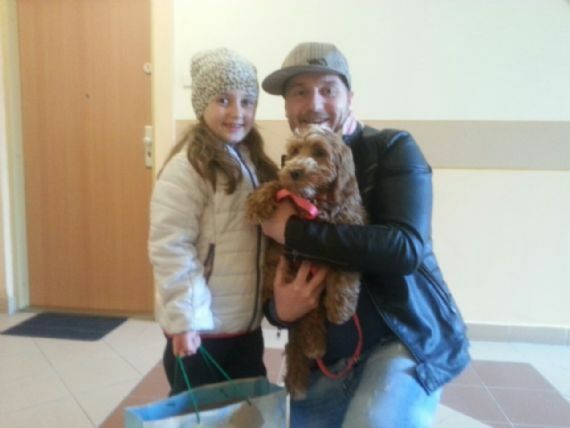 PANNI AND HER DADDY WITH FAITH IN BUDAPEST HUNGARY. 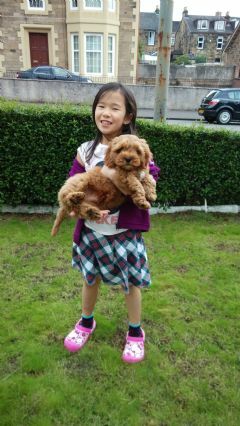 FAITH HAS HER BAGS PACKED AND WILL BE GOING TO BUDAPEST IN HUNGARY TOMORROW TO LIVE WITH PANNI AND FAMILY. OLLIE HERBIE AND WILBUR ALL GOING TO LIVE WITH KATH IN NEWCASTLE UPON TYNE. 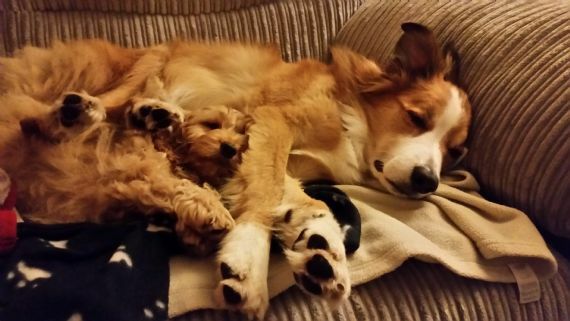 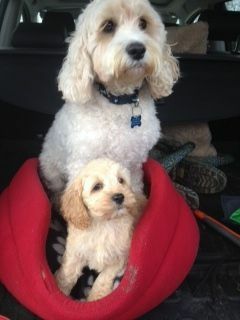 BLOSSOM AND HER NEW PUPPY. 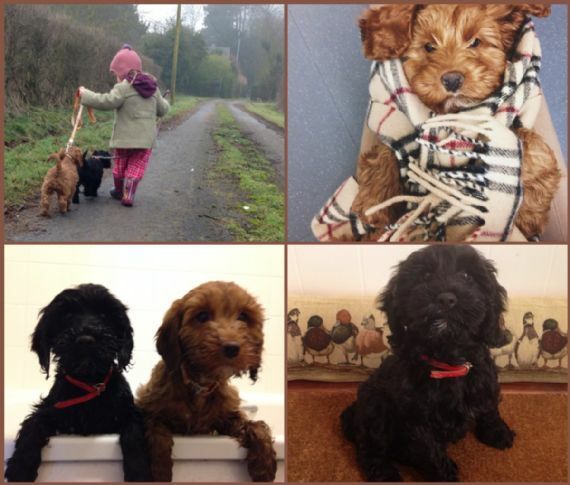 OFF FOR A WALK WITH MY PUPPIES!! CASPAR SETTLED IN WITH HIS NEW MUMMY. 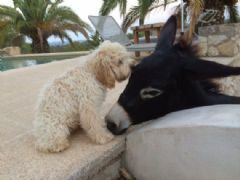 MOLLY AND PAL IN PORTUGAL. 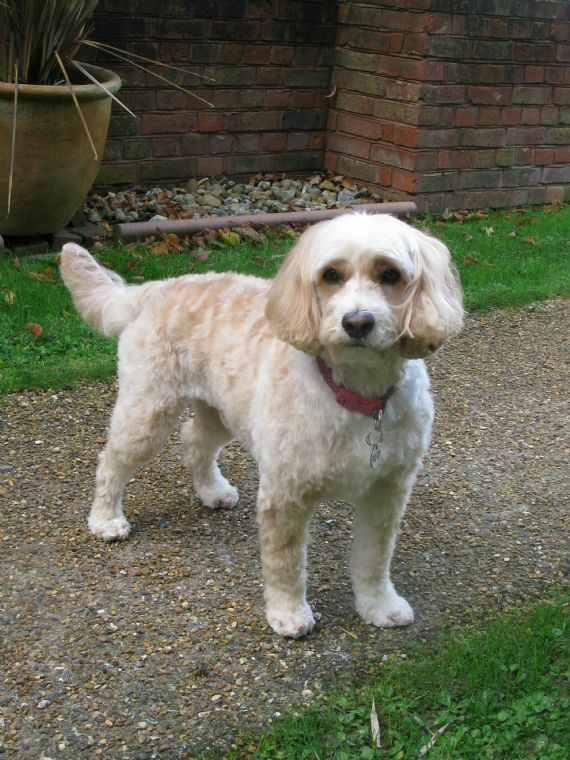 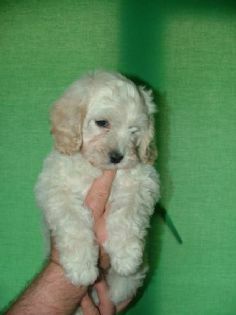 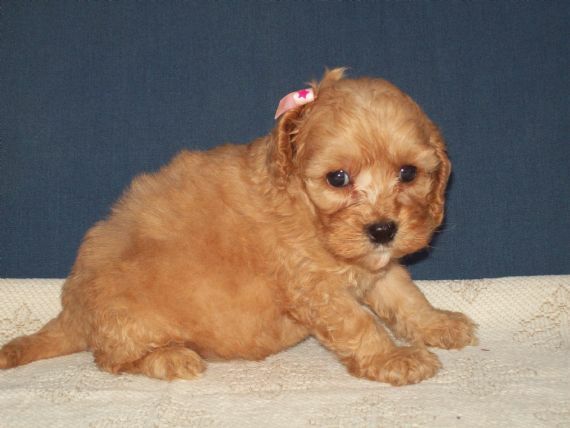 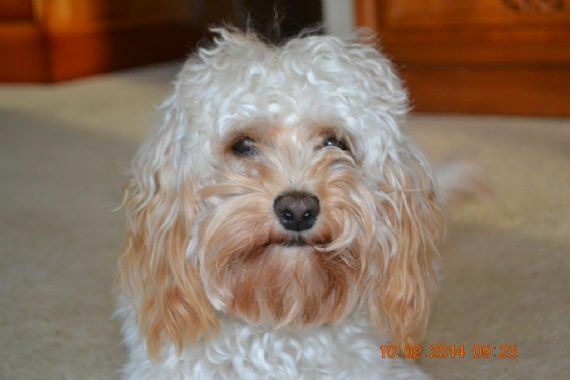 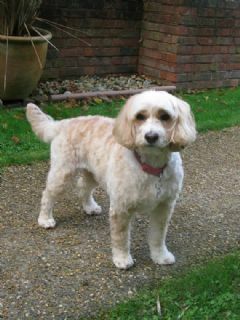 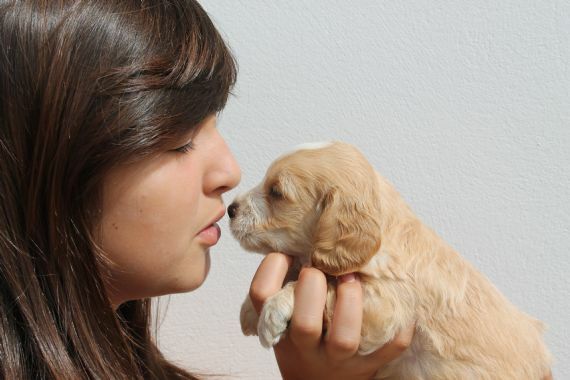 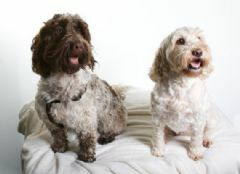 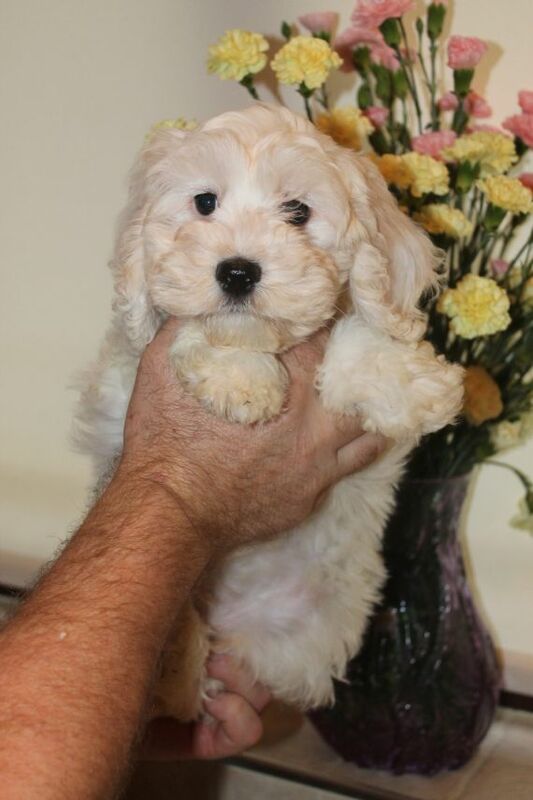 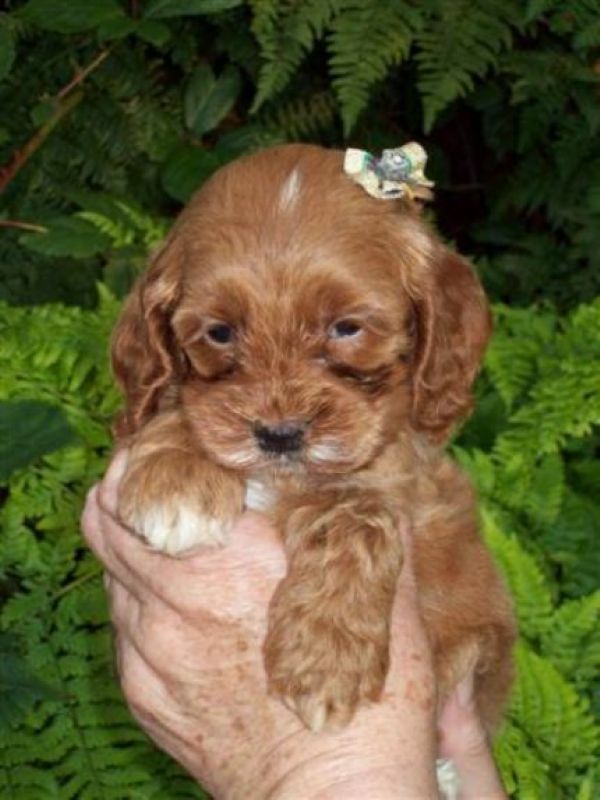 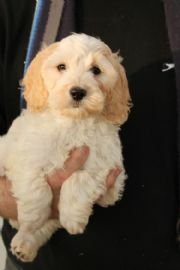 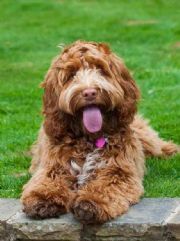 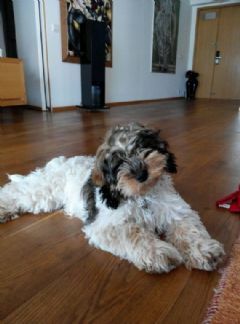 At Jandaz, we have been cockapoo breeders for more than 10 years and only breed American or English Show Cockapoos. 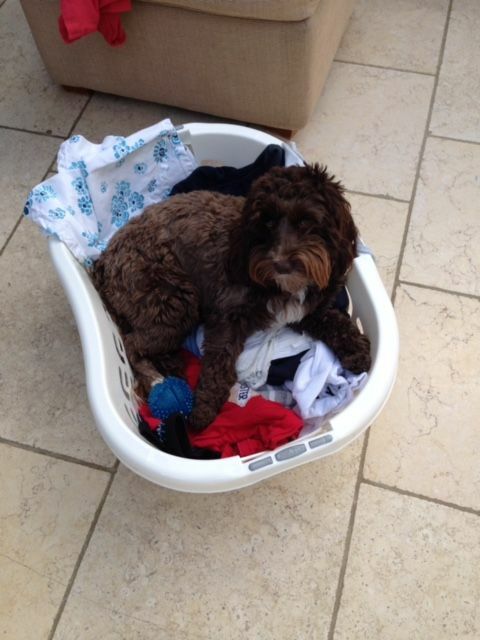 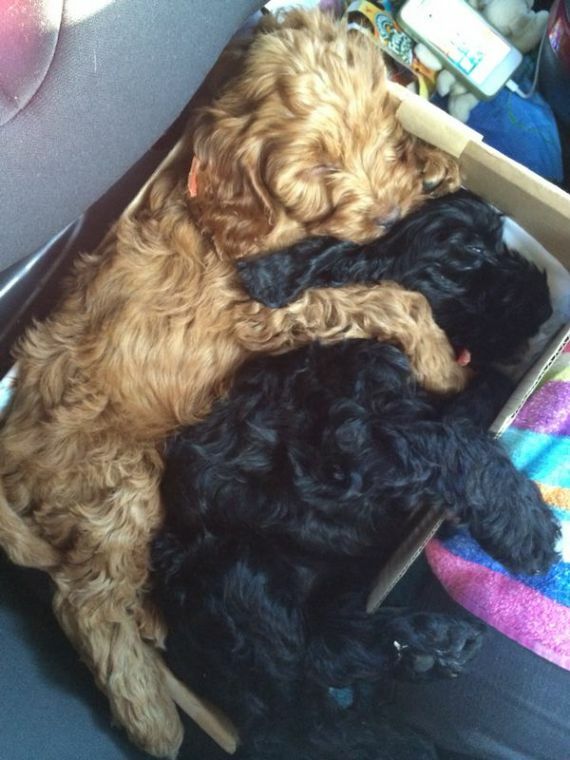 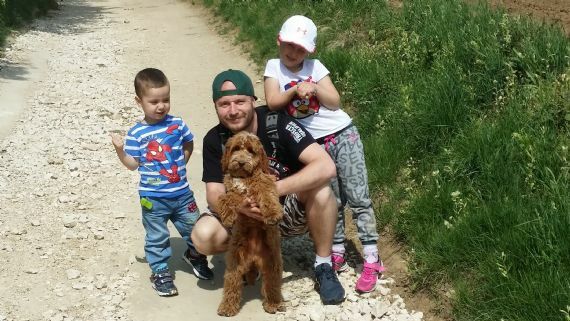 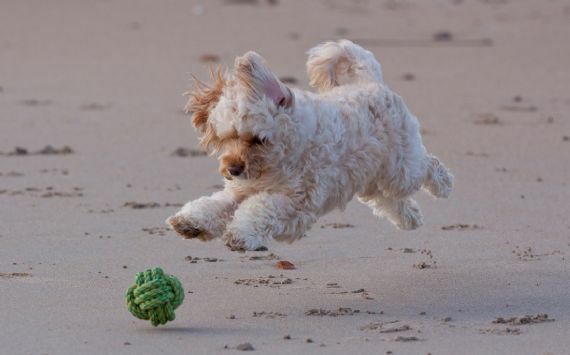 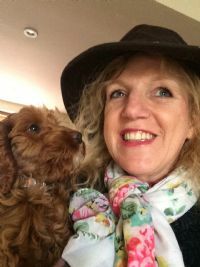 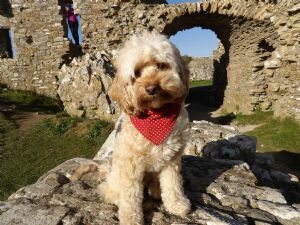 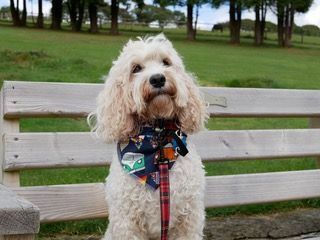 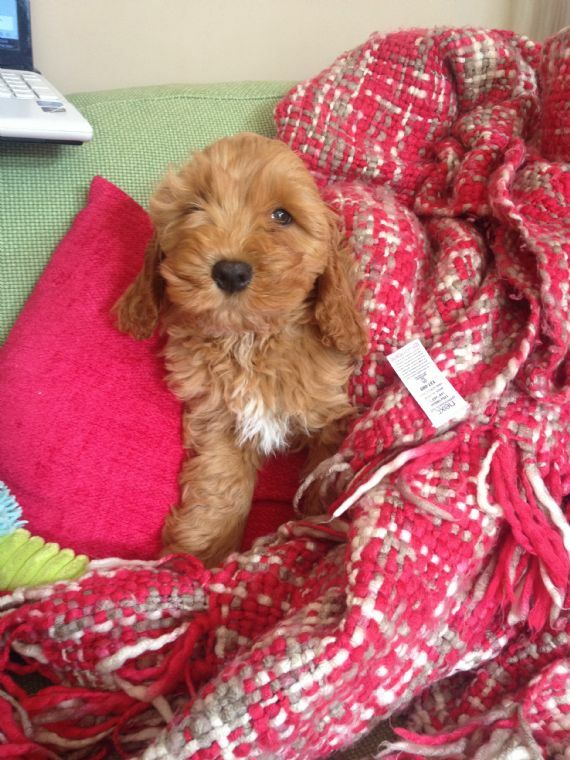 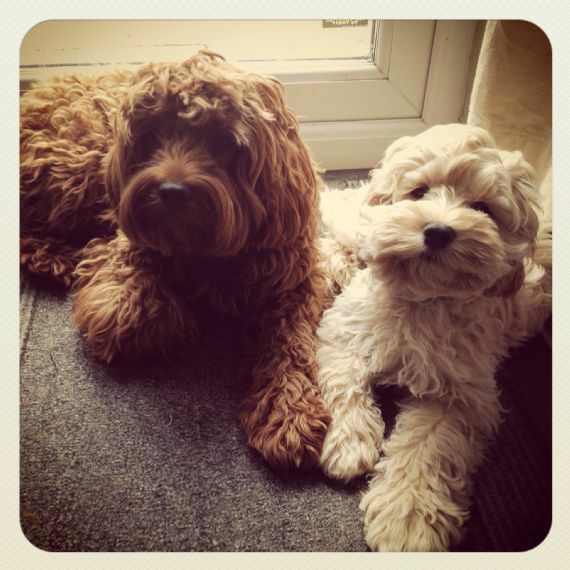 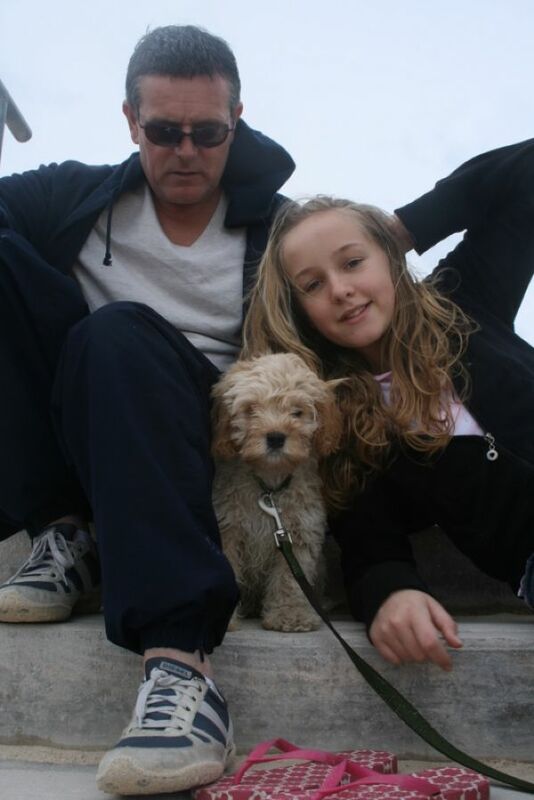 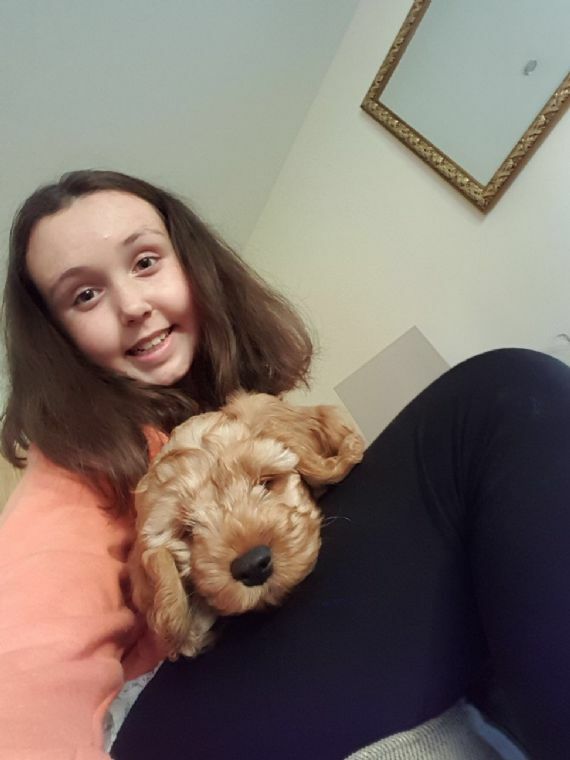 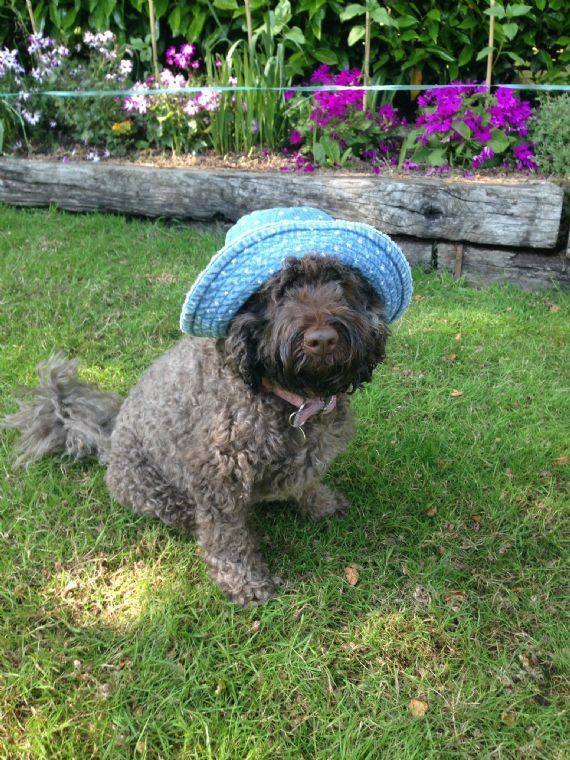 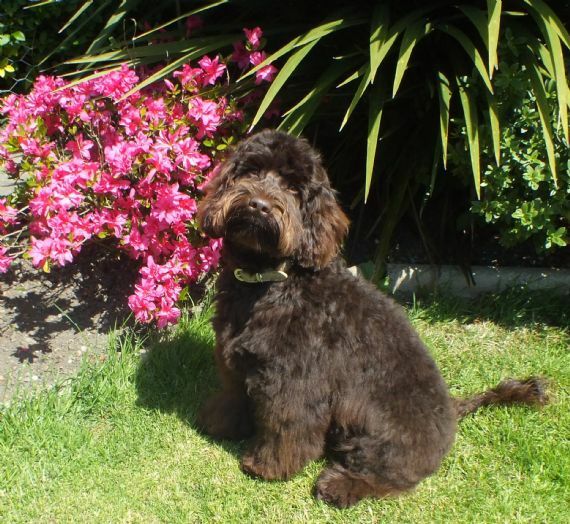 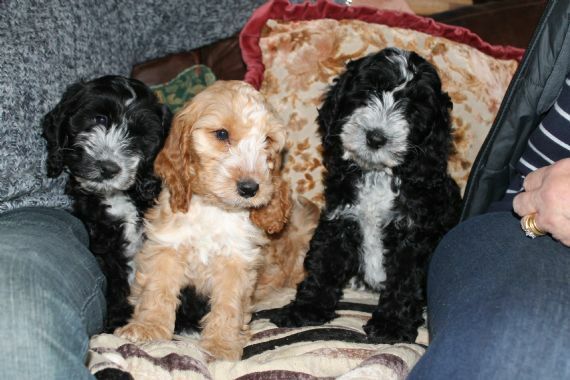 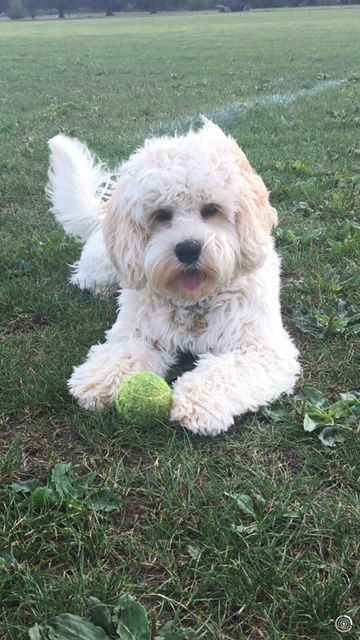 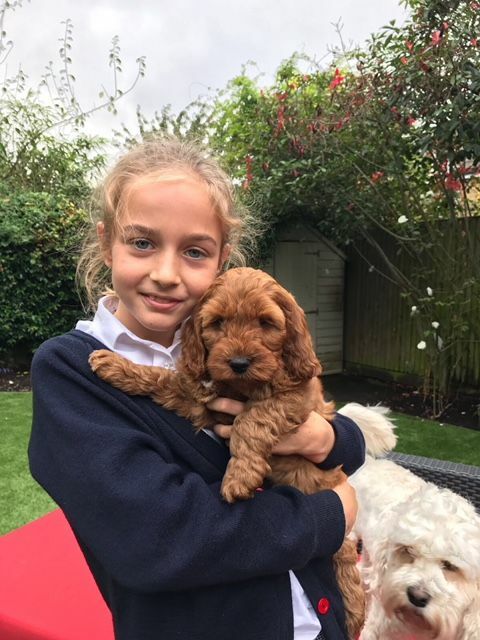 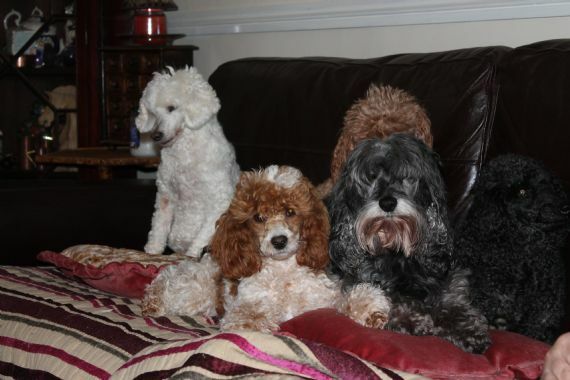 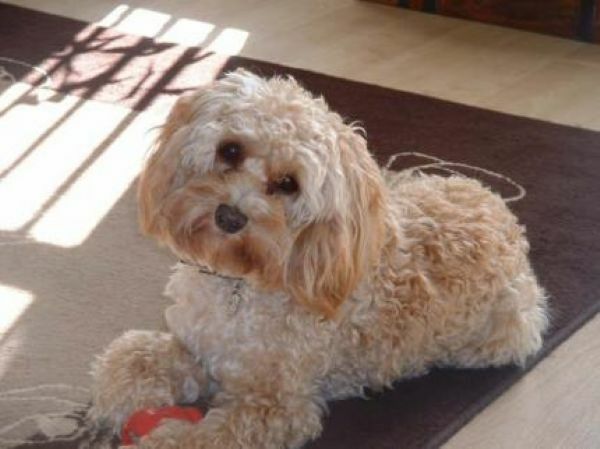 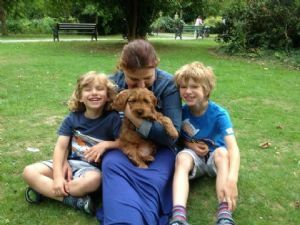 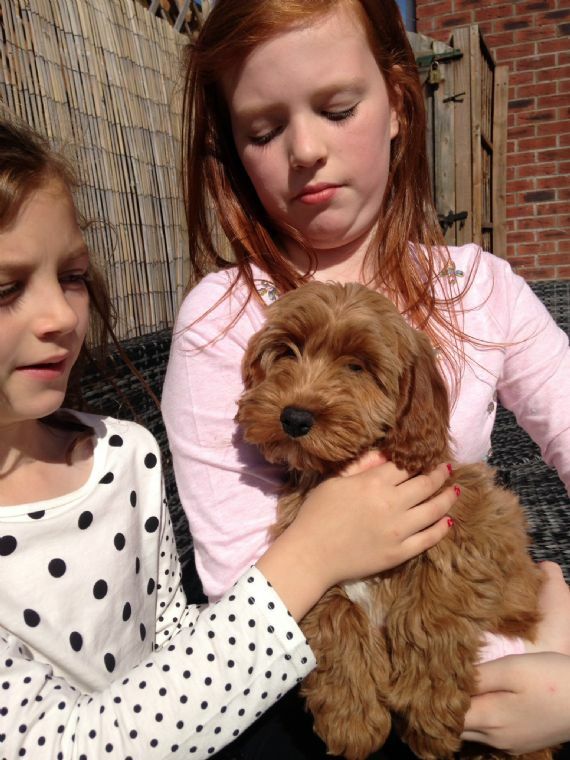 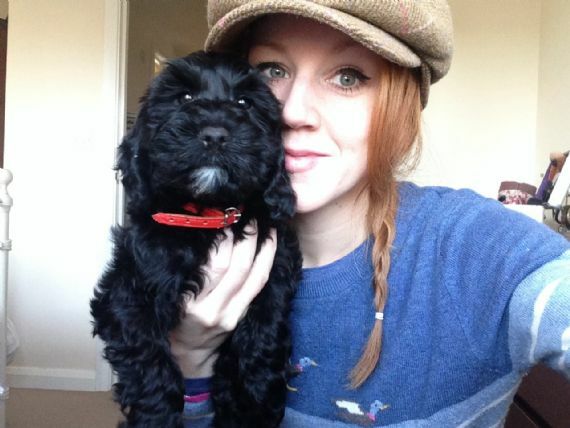 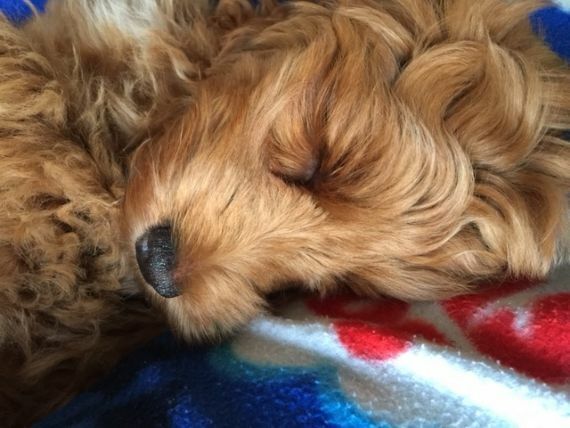 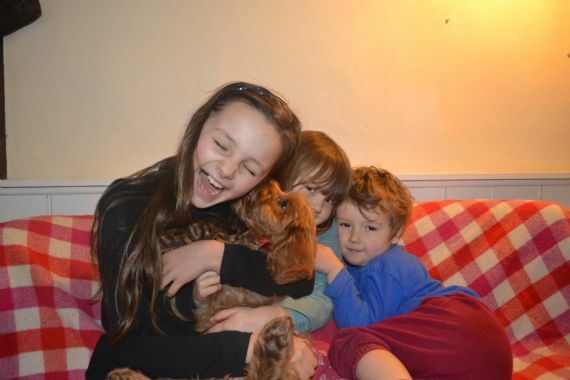 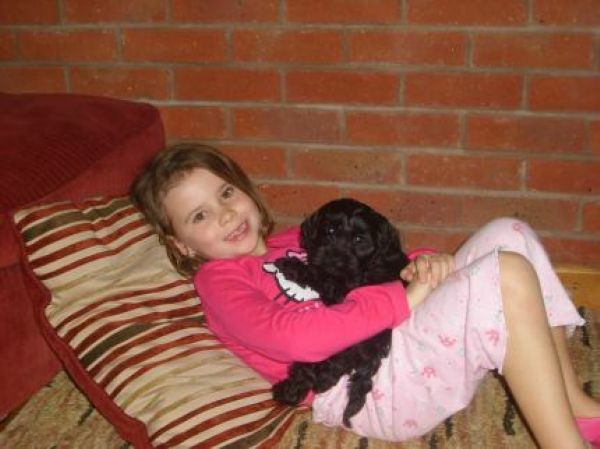 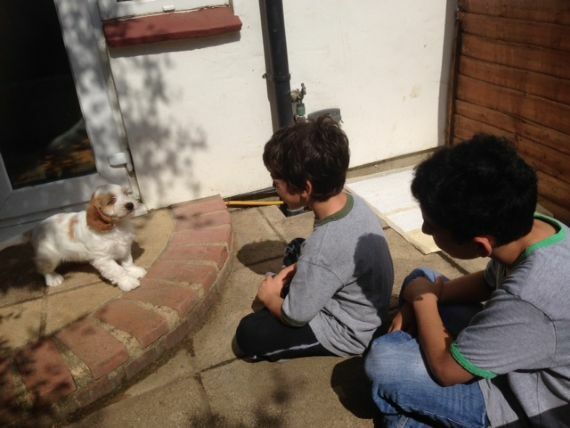 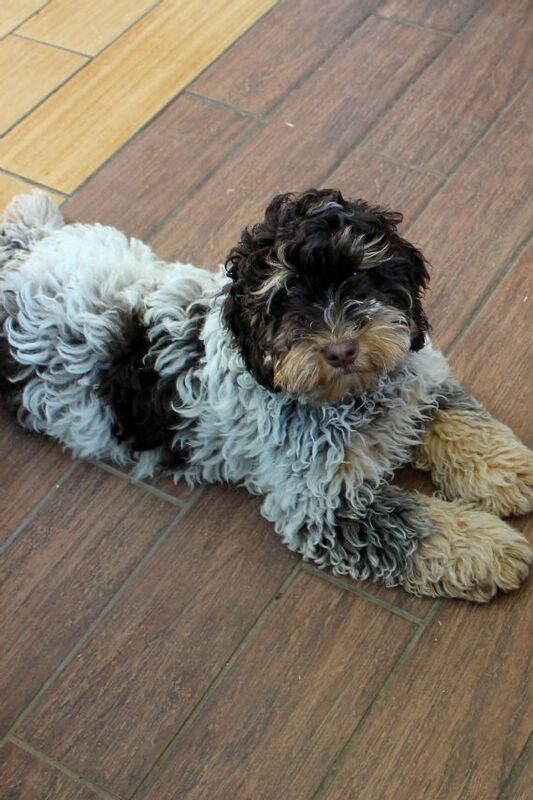 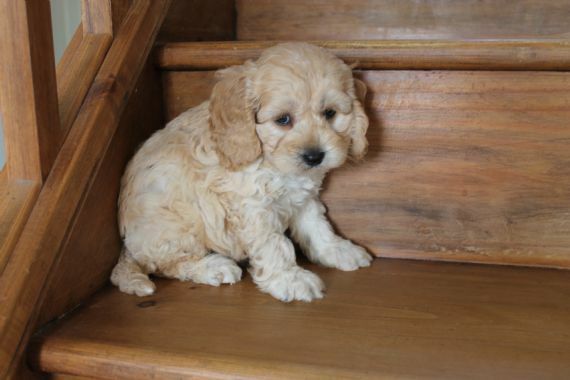 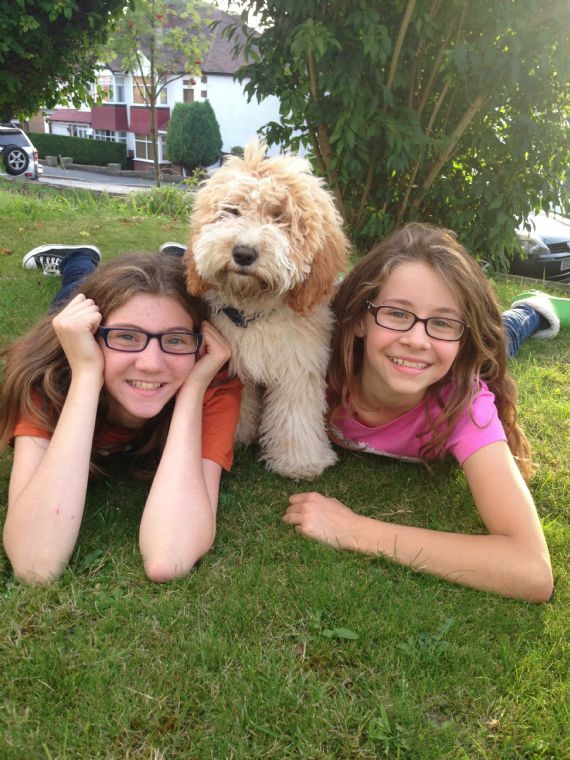 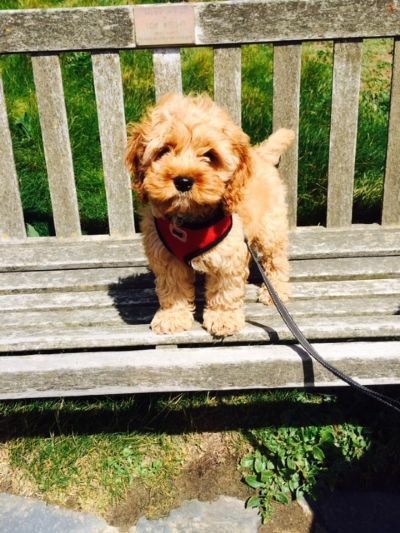 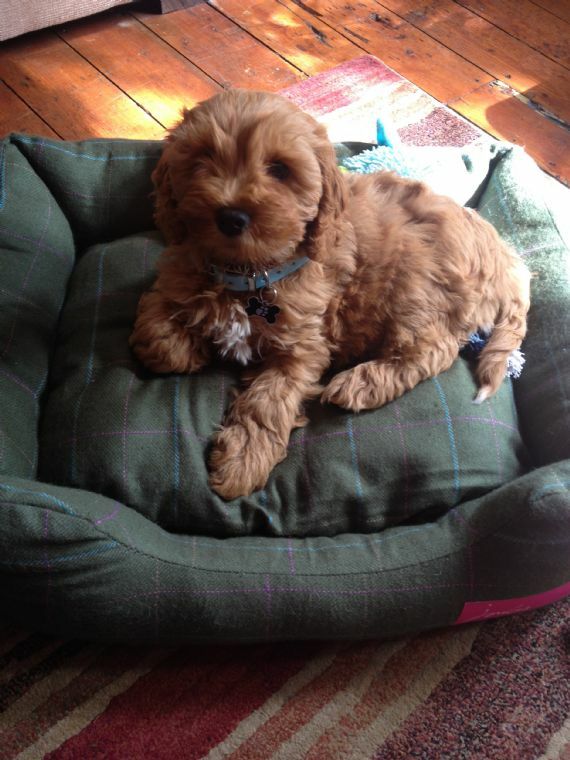 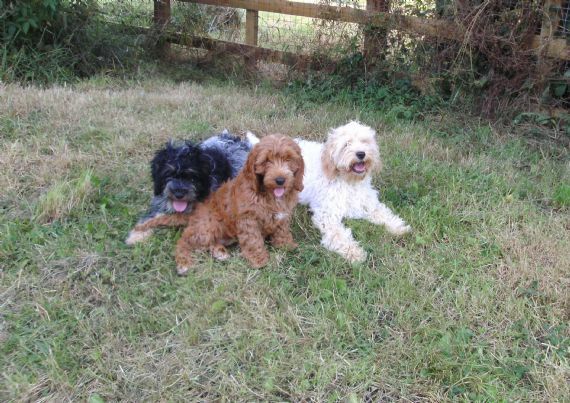 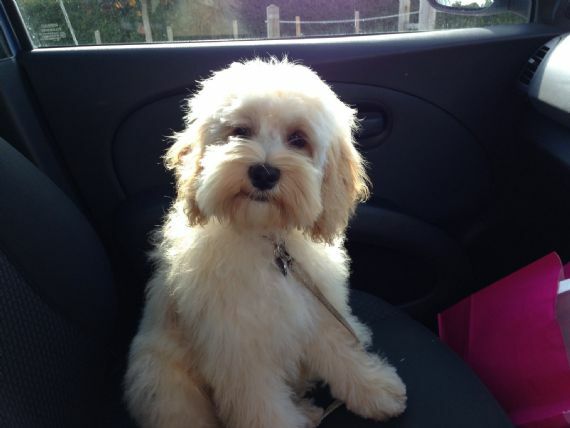 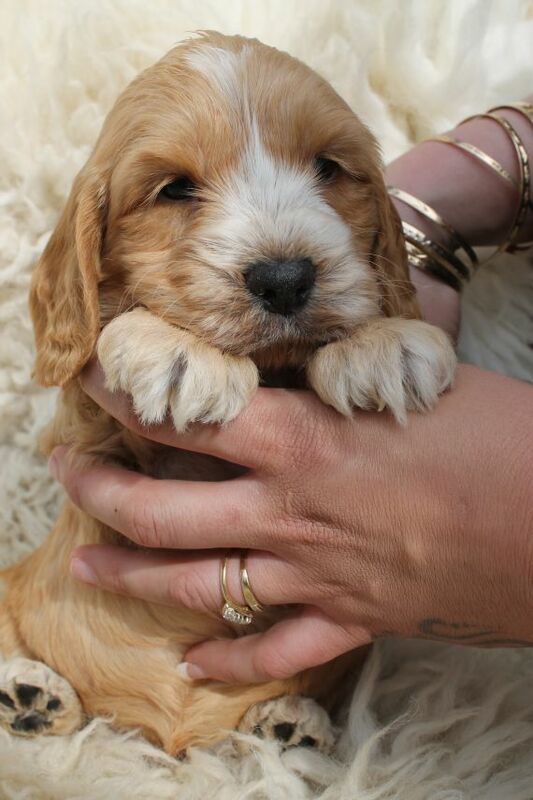 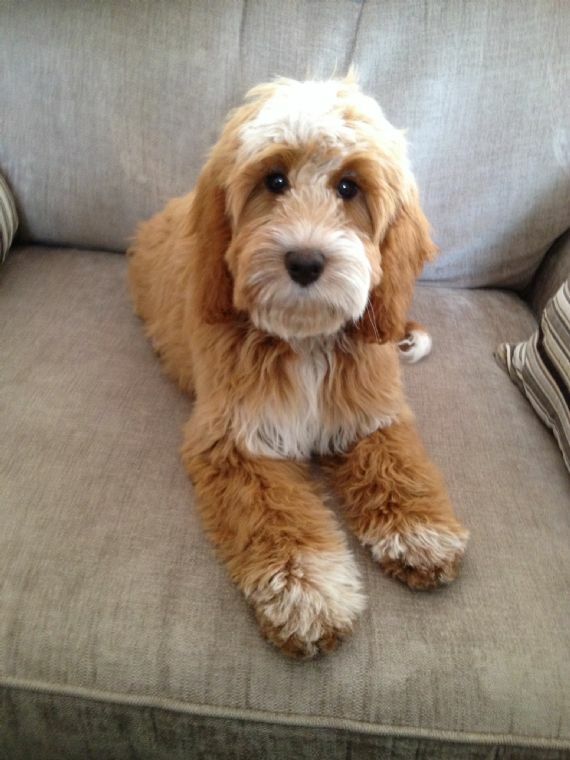 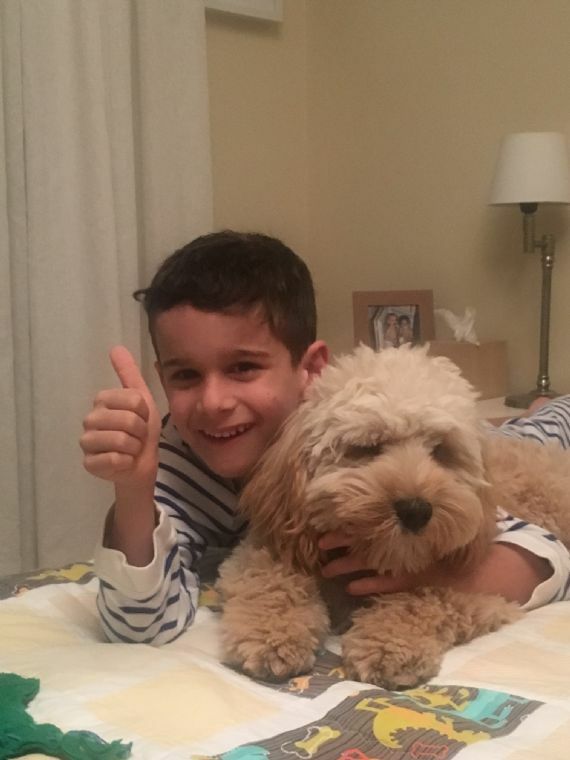 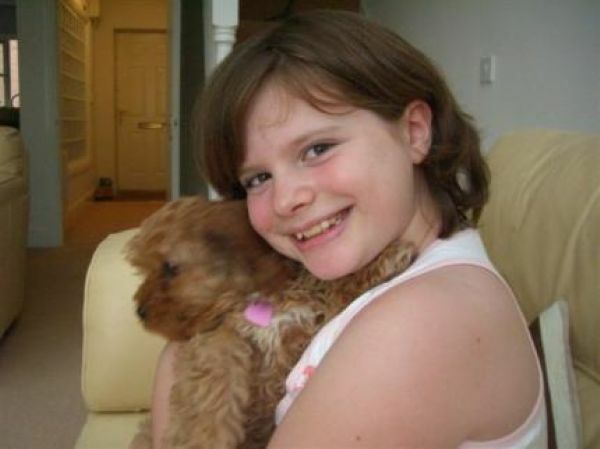 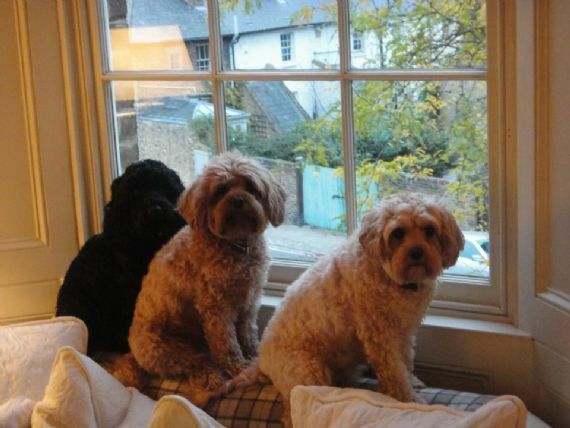 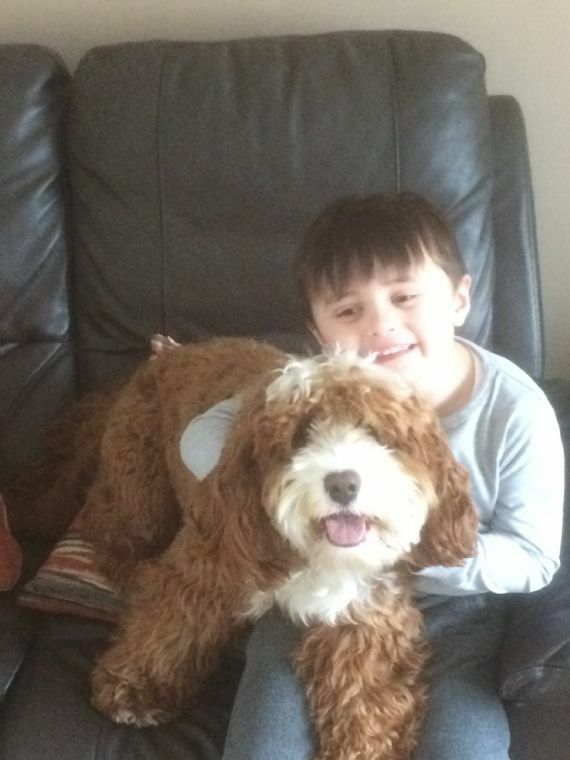 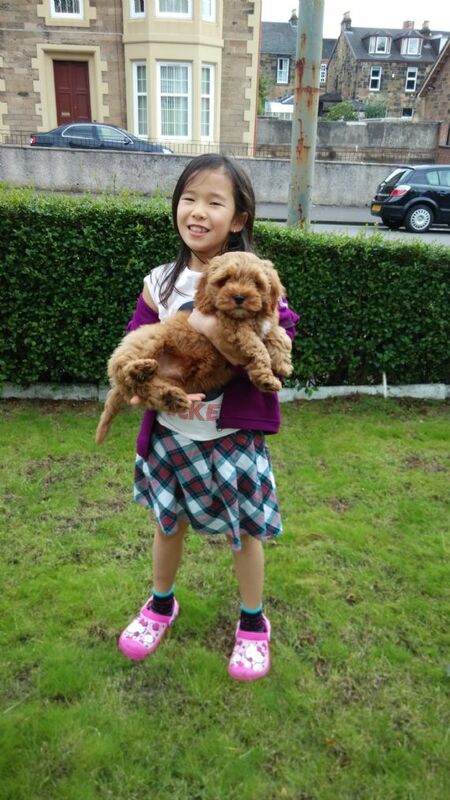 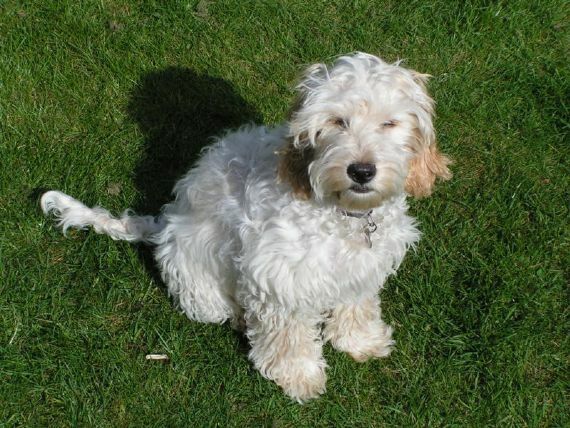 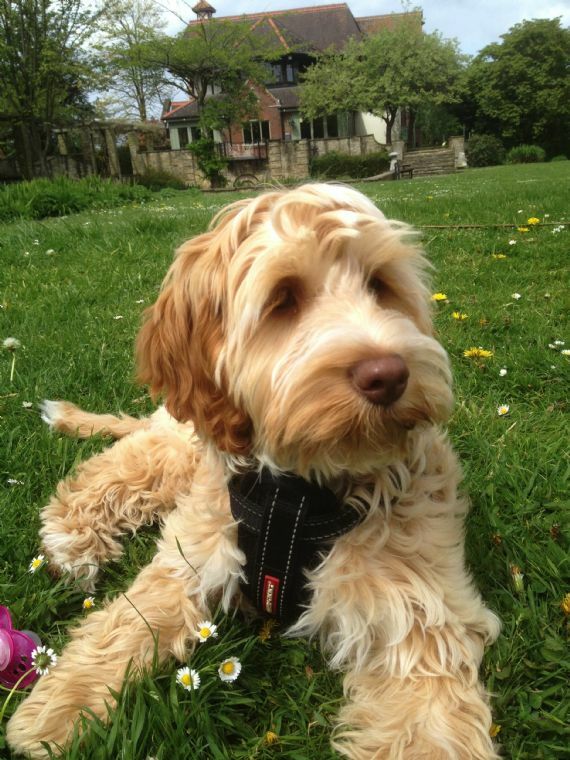 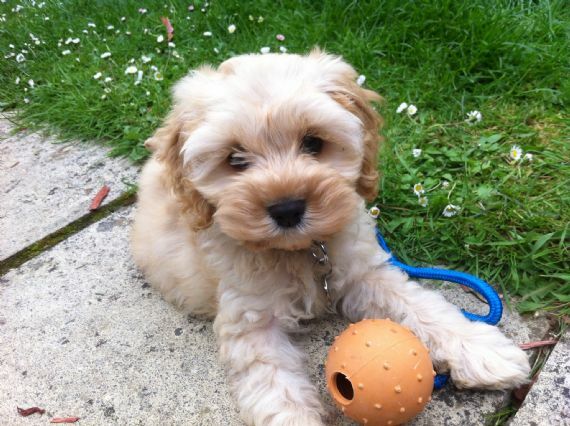 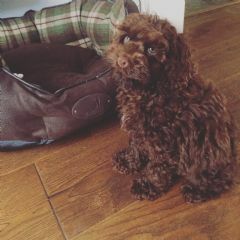 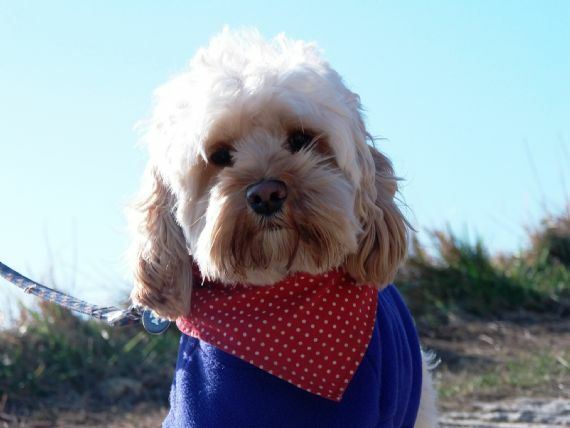 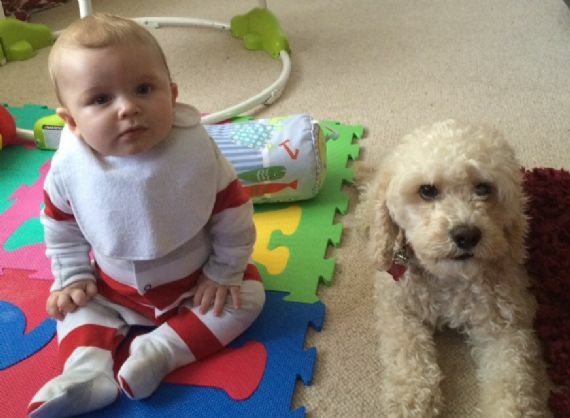 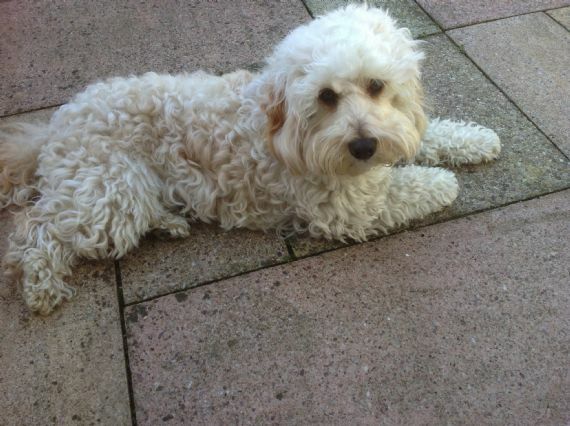 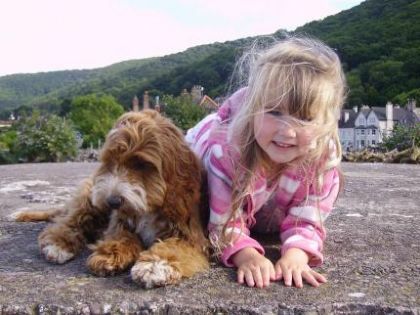 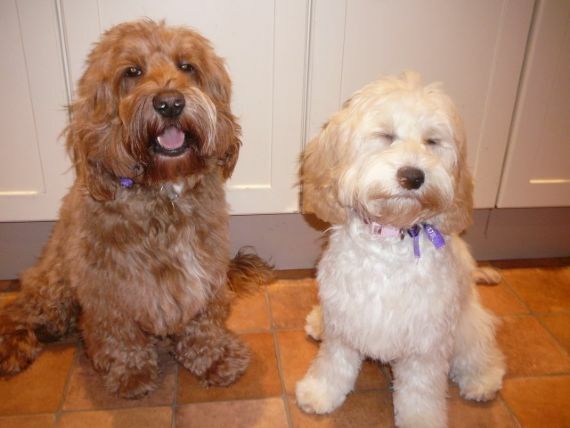 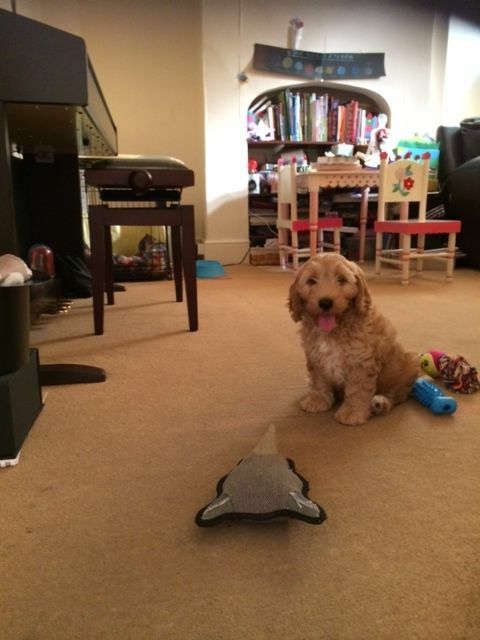 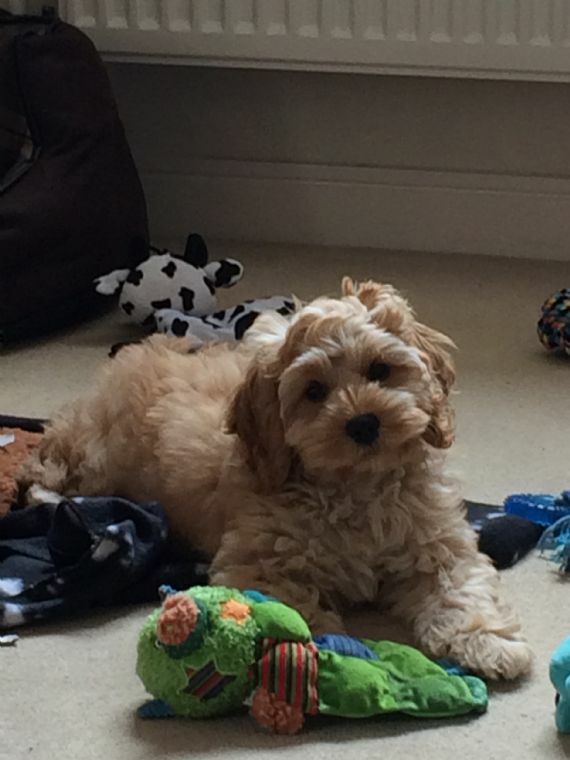 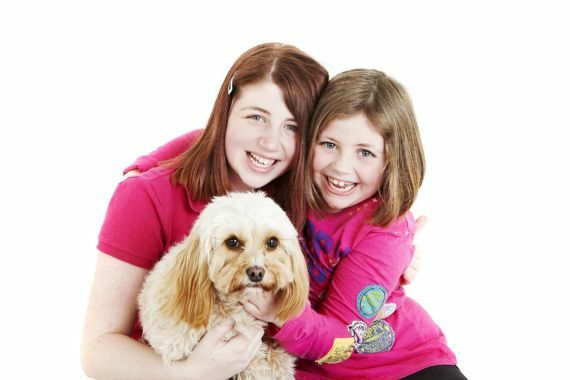 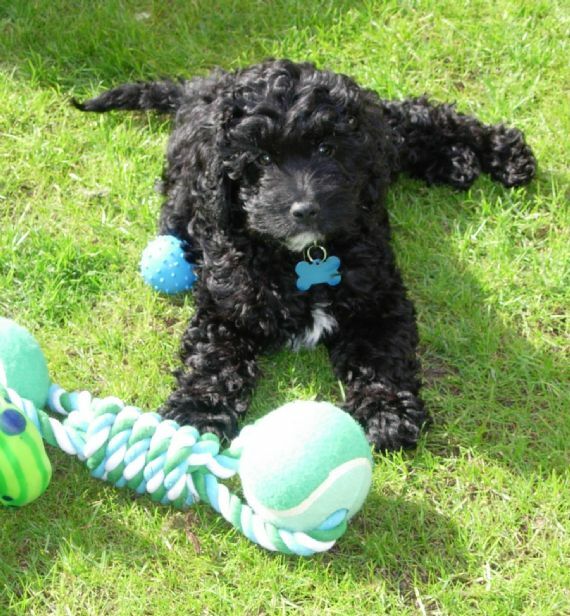 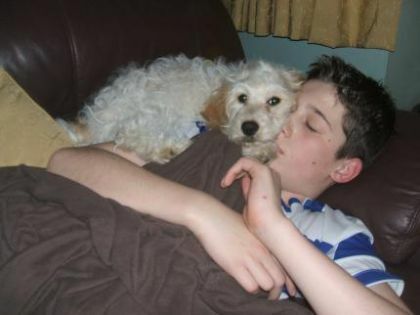 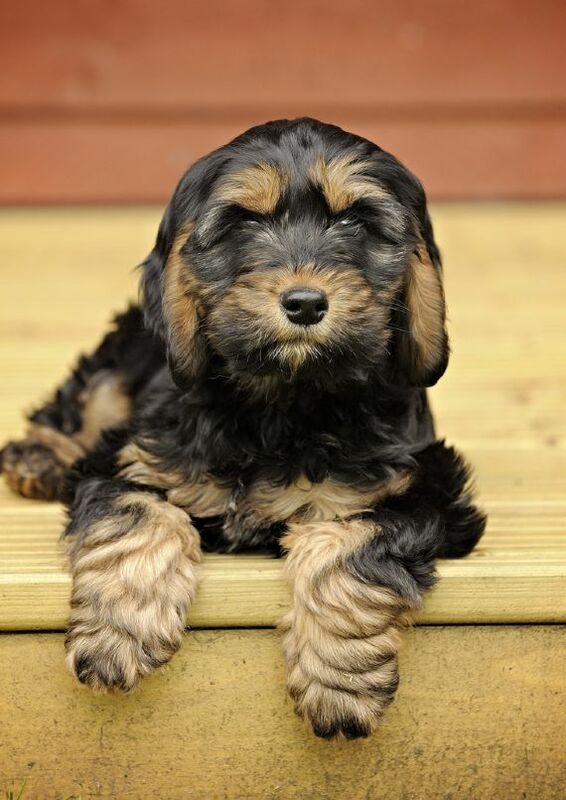 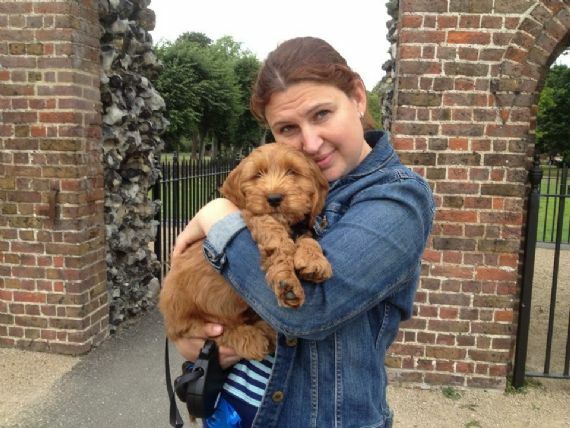 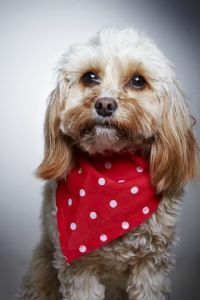 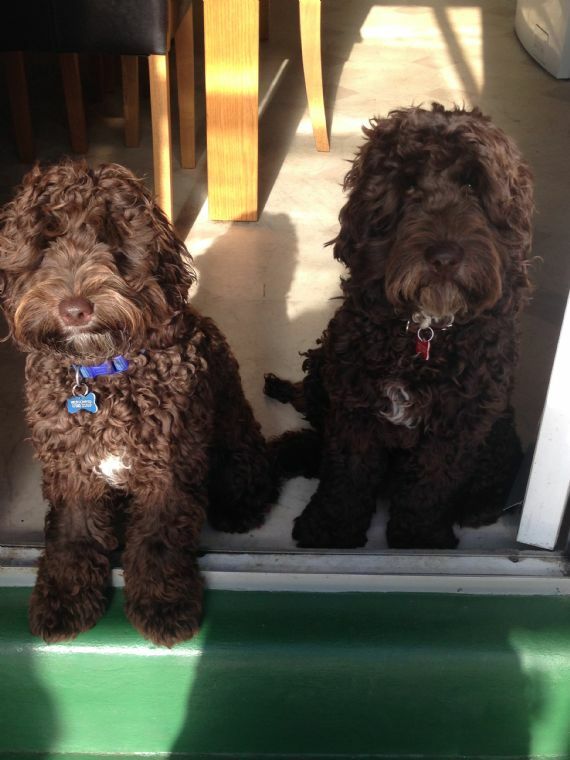 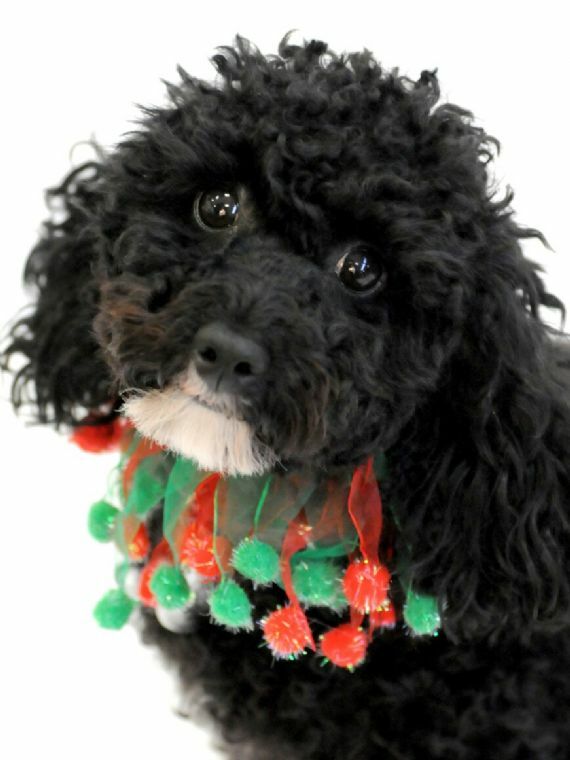 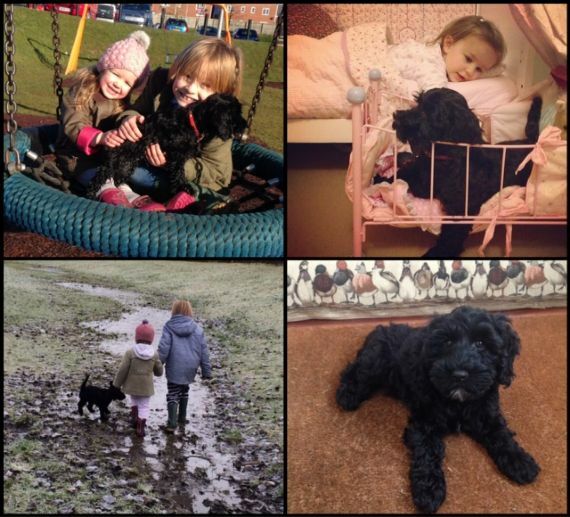 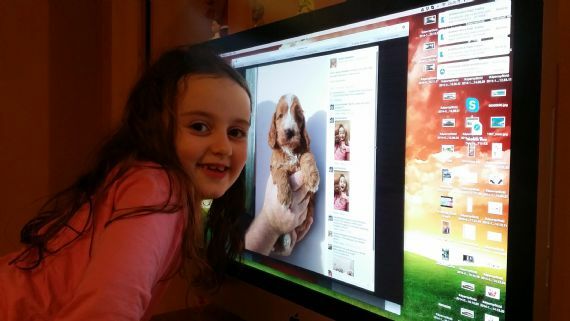 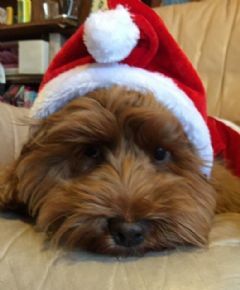 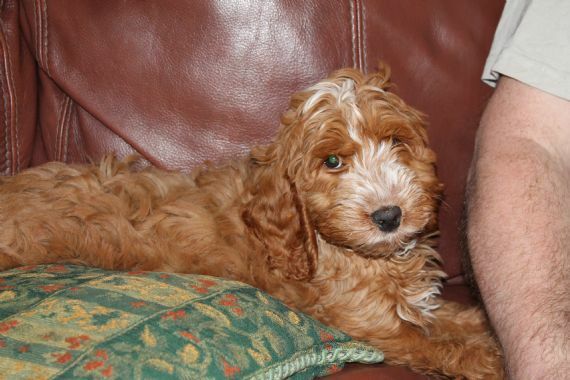 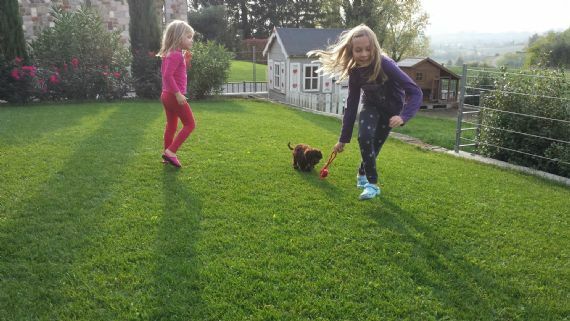 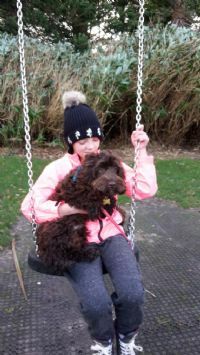 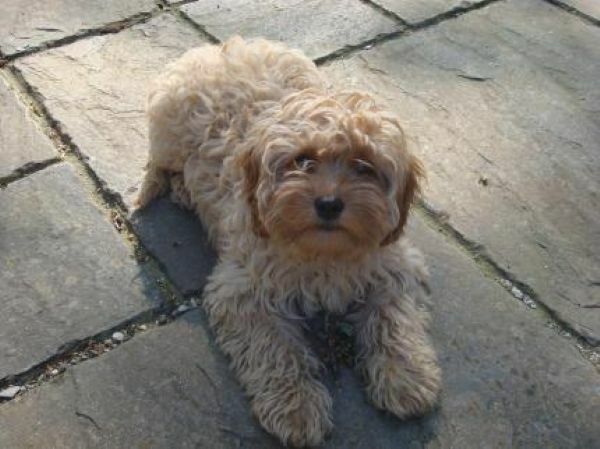 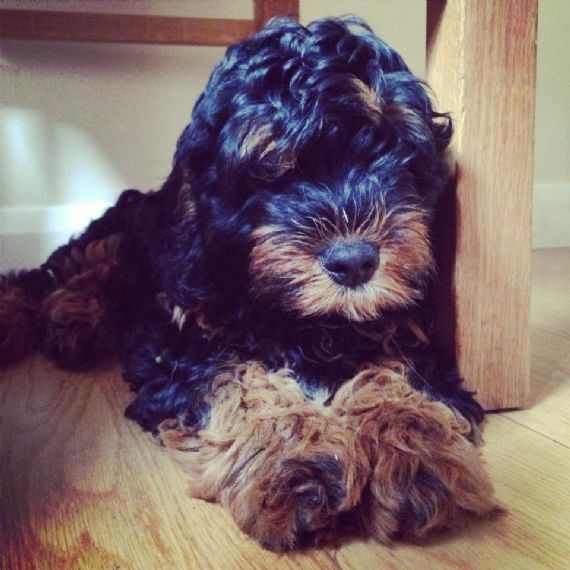 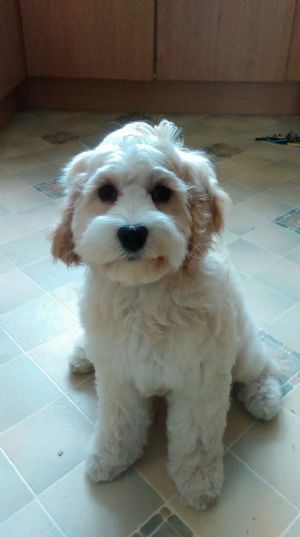 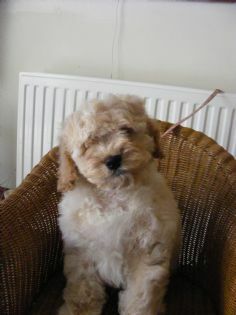 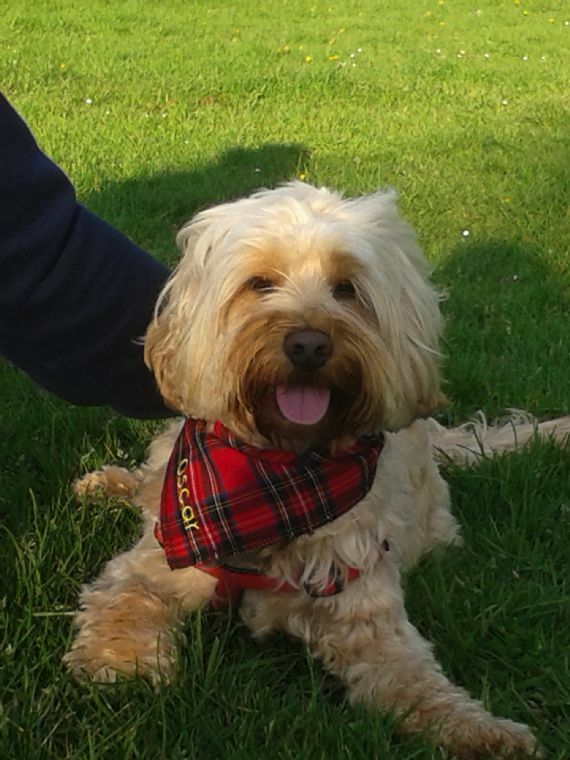 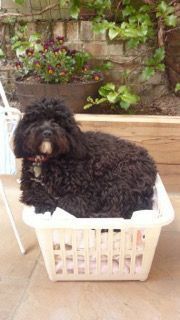 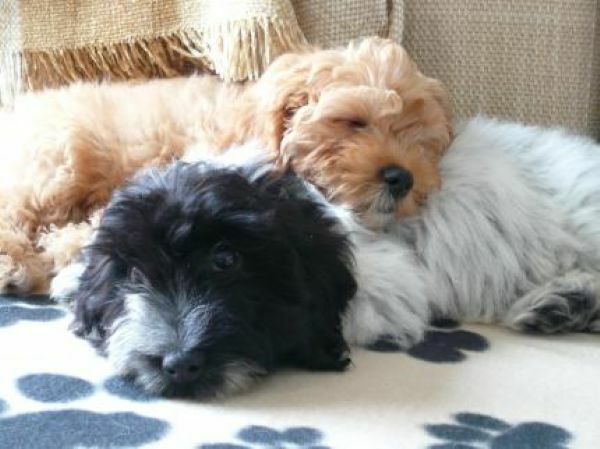 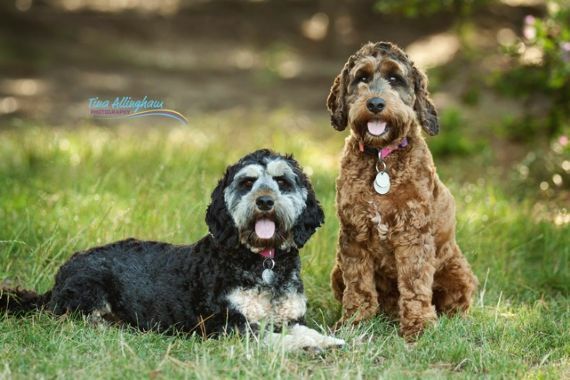 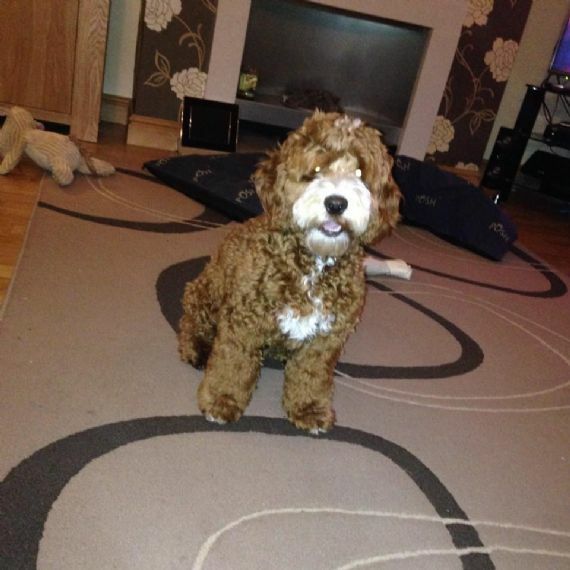 We supply our cockapoo puppies to families across the UK and overseas - we can prepare all export papers, vaccinations and passports to meet the individual country’s requirements. 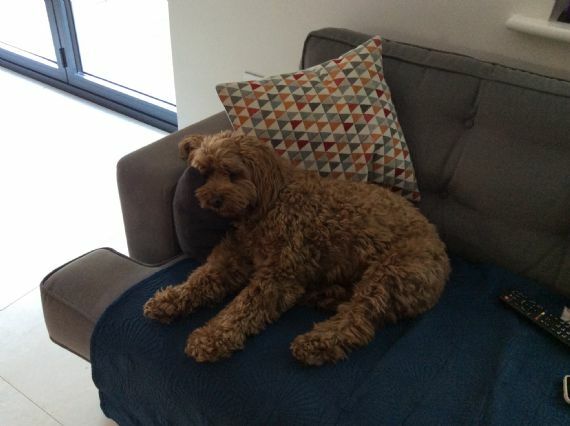 Jandaz can coordinate the process from start to finish with the welfare of the dog and the satisfaction of the customer our top priority. 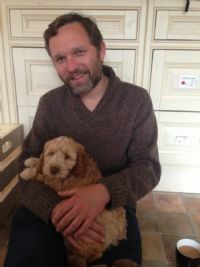 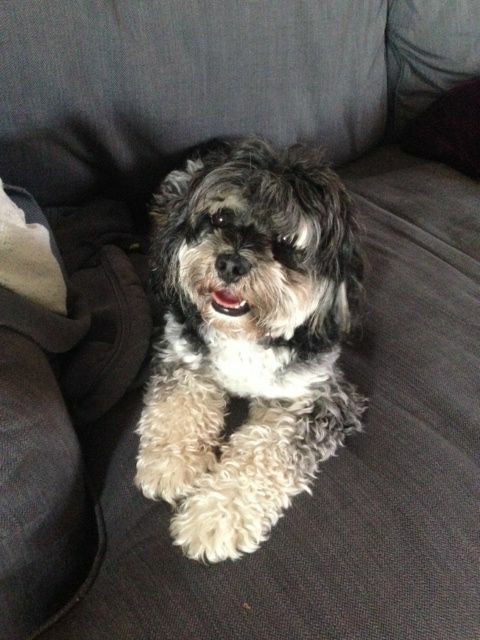 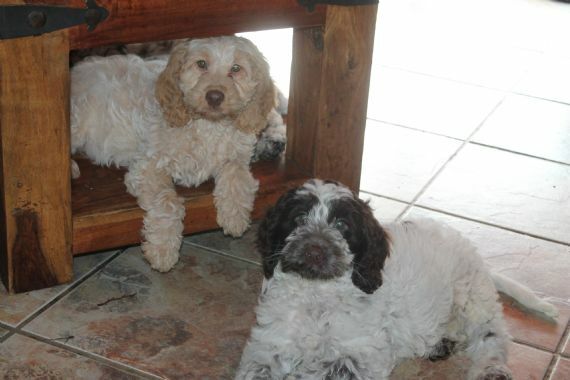 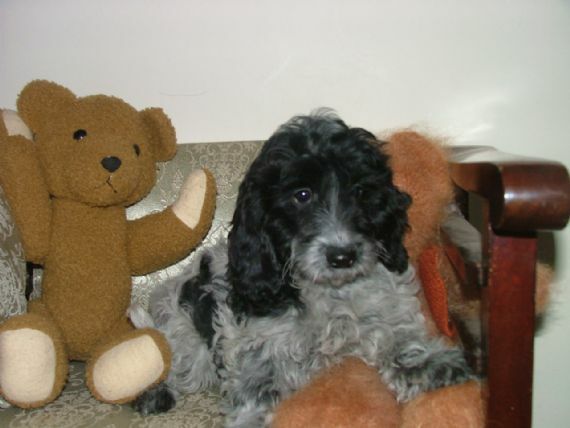 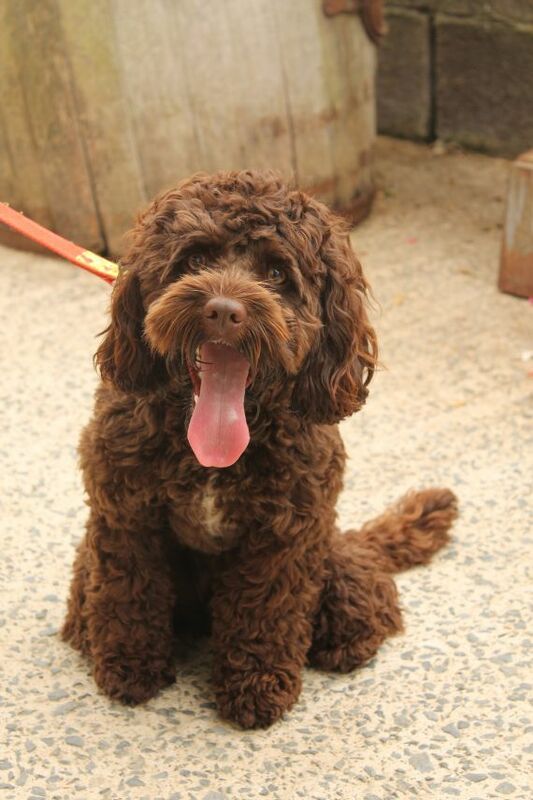 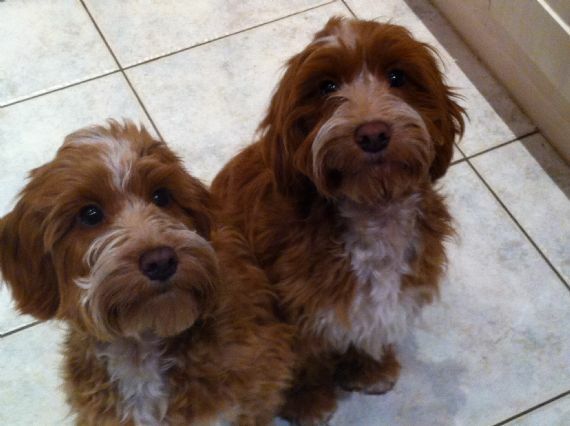 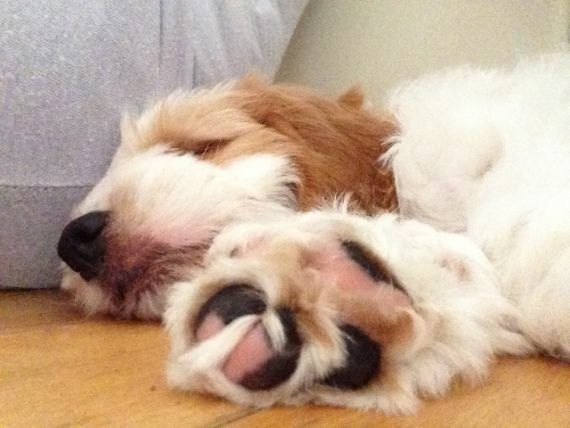 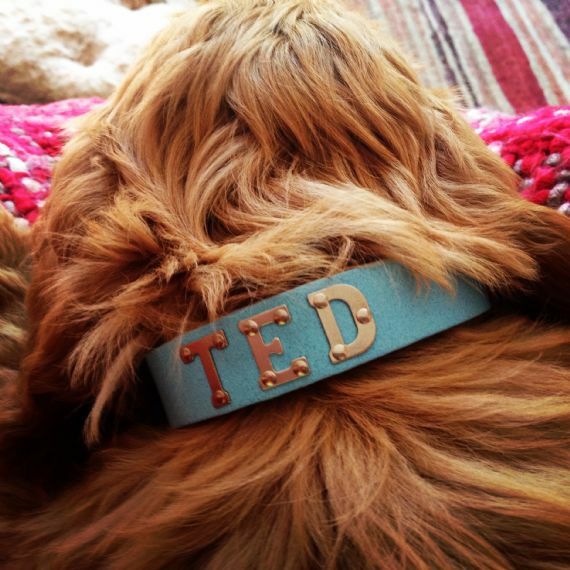 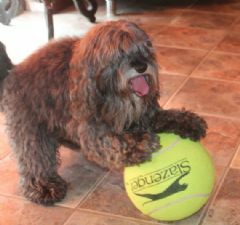 Jandaz is a responsible cockapoo breeder and our puppies only go to loving homes. All Jandaz cockapoos for sale automatically include four weeks FREE PetPlan insurance and have been micro-chipped,FULLY VACCINATED health checked, wormed and treated for ear mites. 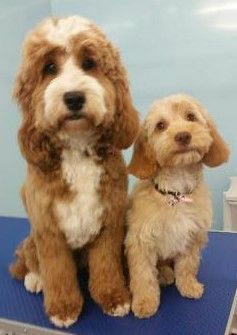 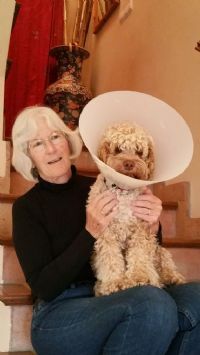 All cockapoo parents are also eye-tested and Progressive Retinal Atrophy (PRA) cleared. 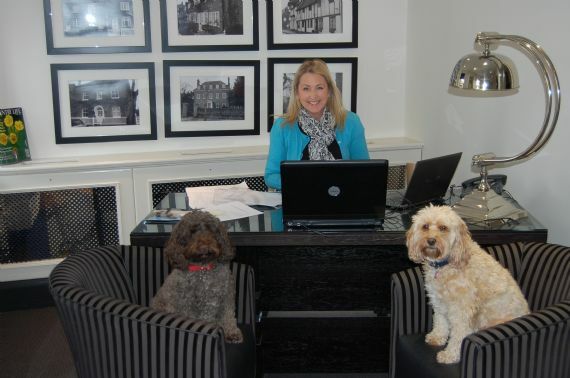 Contact the Jandaz team today on 01545 560641 or contact us here. 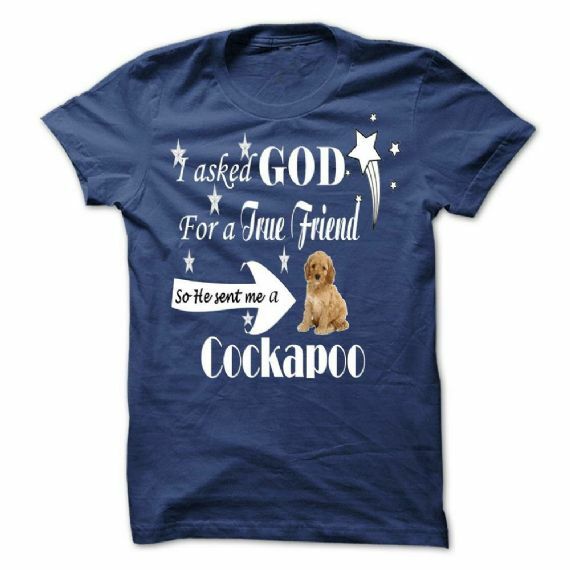 You can also read our customer reviews or visit Jandaz Cockapoos on Facebook. 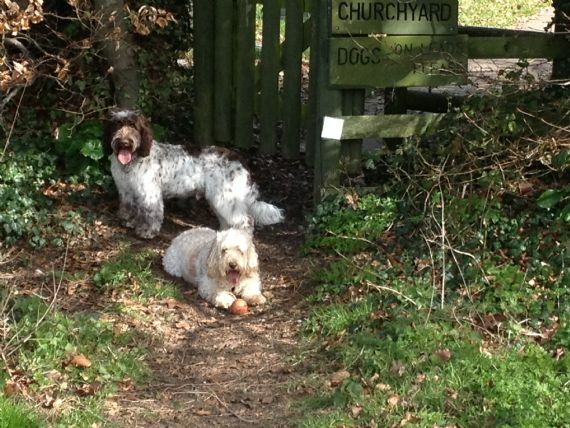 WE ARE SO BUSY !!! 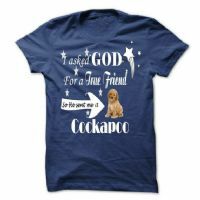 SO PLEASE IN THE FIRST INSTANCE EMAIL ME . 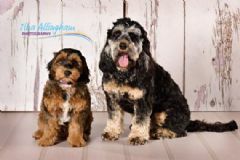 OUR PUPPIES ARE GOING TO DISTANT PARTS OF THE WORLD ,BE ASSURED WE CHECK OUT WERE EVERY PUPPY GOES AND WE DO ALL THE RABIES SHOTS AND NEW STYLE TAMPER PROOF PASSPORTS. 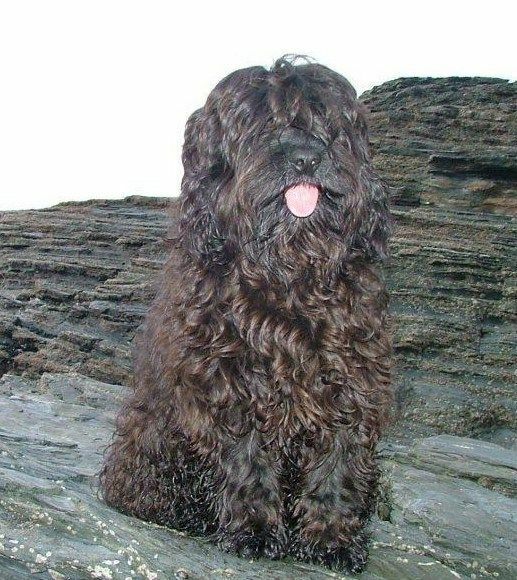 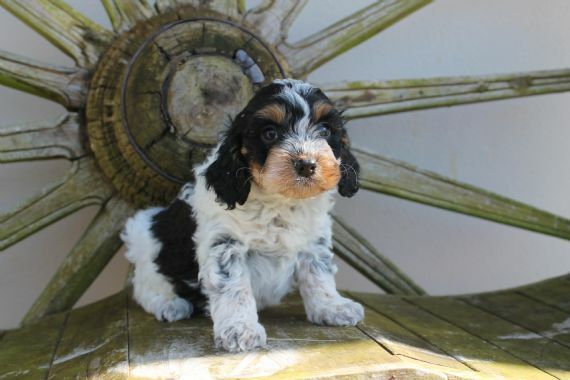 WE PRODUCE EYE TESTED ,INSURED , AND CALM PUPPIES FROM SHOW AND AMERICAN COCKERS WE DO NOT BREED FROM WORKING COCKER CROSSES THEY ARE VERY ENERGETIC! 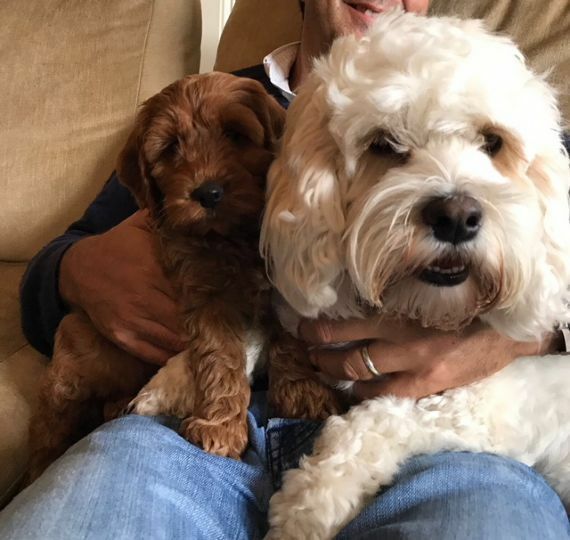 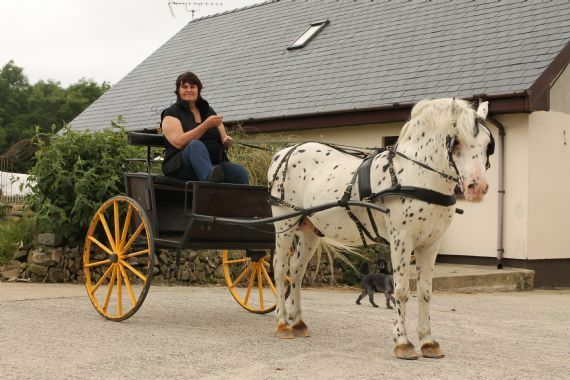 BUT IF THAT IS WHAT YOU WANT THEN I CAN ADVISE ON A GREAT BREEDER.WE CAN ALSO RECOMMEND A FANTASTIC COMPANY WHO WILL ARRANGE FOR YOUR PET TO TRAVEL TO ANY PART OF THE WORLD. 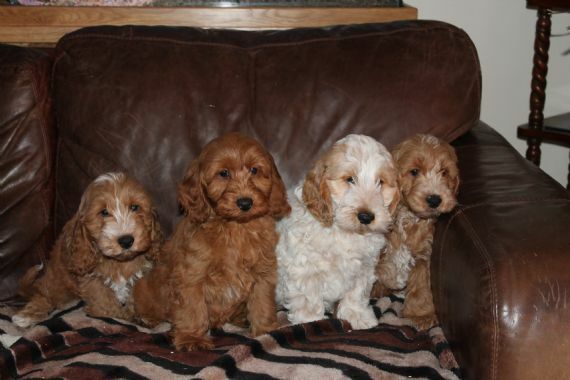 NB ALL OUR PUPPIES ARE FULLY VACCINATED SO READY TO GO OUT IN TO THE BIG WORLD FOR WALKS. 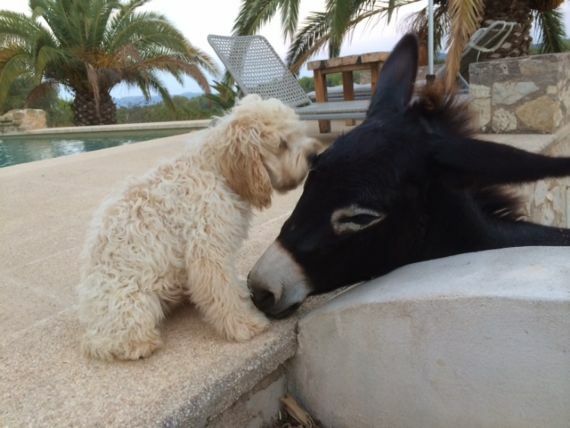 SAMMY IN MALLORCA WITH HIS PAL. 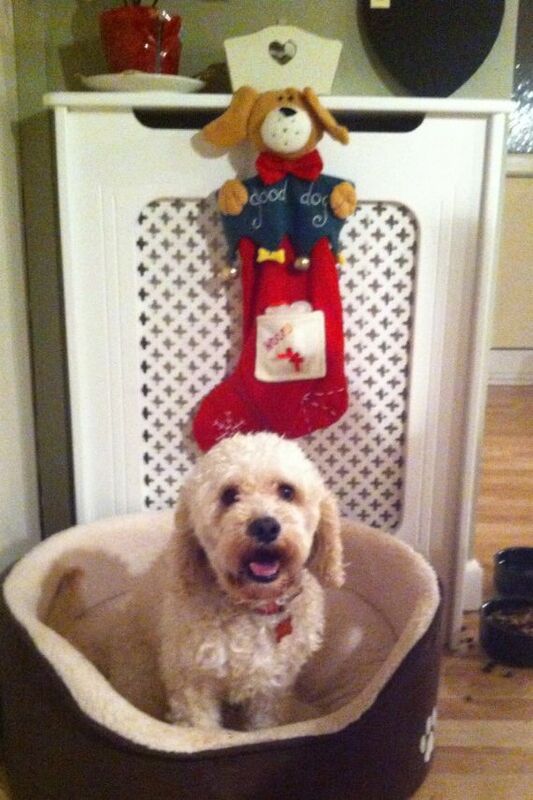 TOFFEE GETTING READY FOR XMAS. 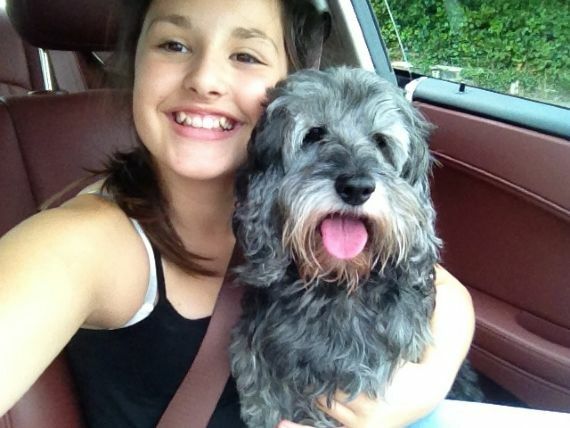 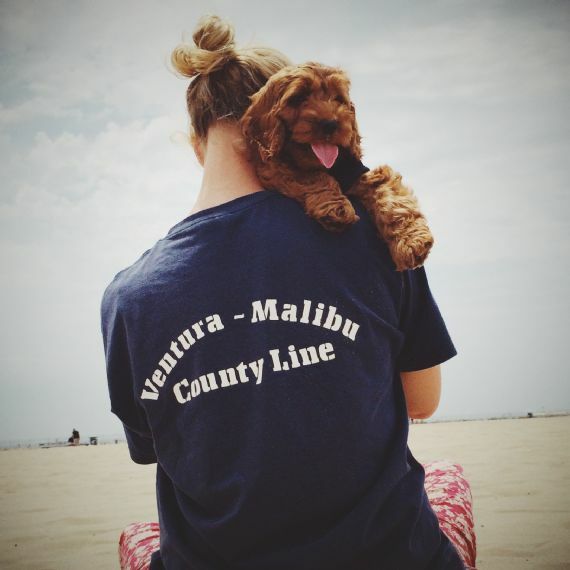 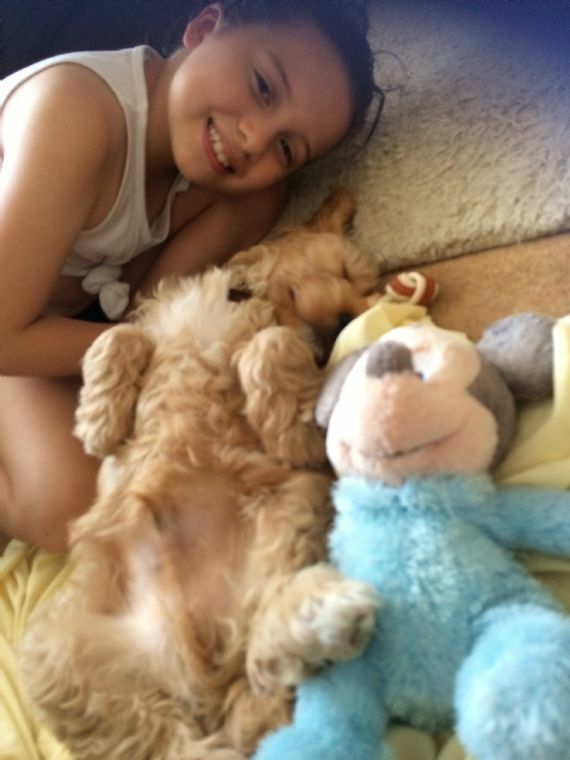 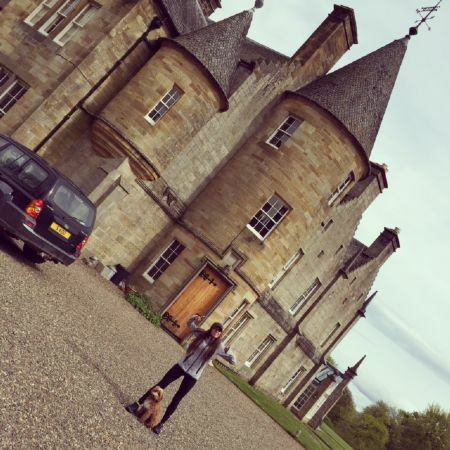 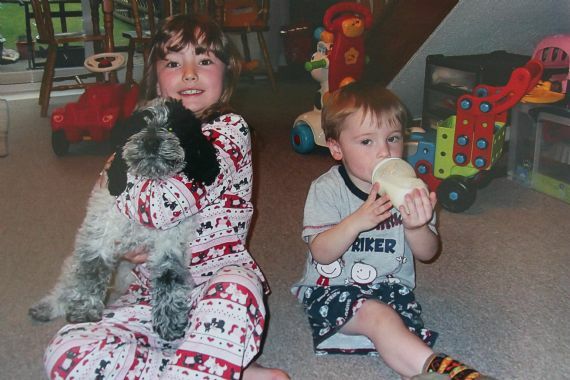 MICHAELA AND HER 2ND JANDAZ PUPPY LIVING THE GOOD LIFE IN AMERICA. 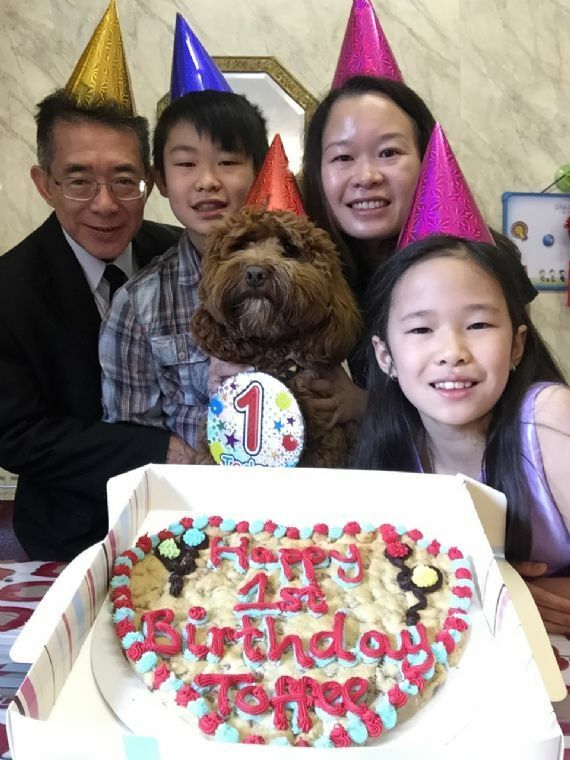 JANDAZ FLYING THE FLAG IN HONG KONG. 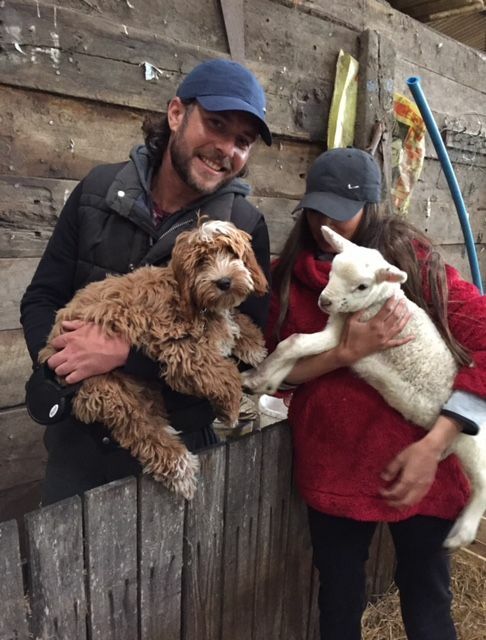 THESE GIRLS ARE WITH A TOP BREEDER OF COCKAPOOS SIMPLY THE BEST AGAIN!!! 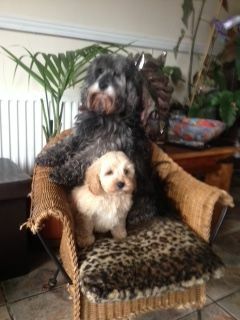 JANDAZ HAVE PUPPIES AVAILABLE FOR JANUARY THROUGH TO MARCH PLEASE EMAIL FOR INFORMATION. 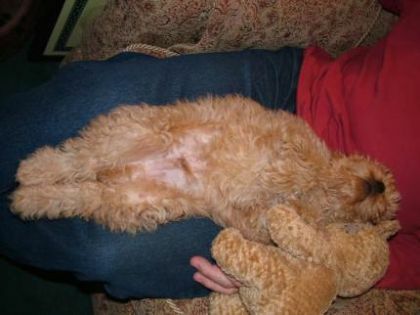 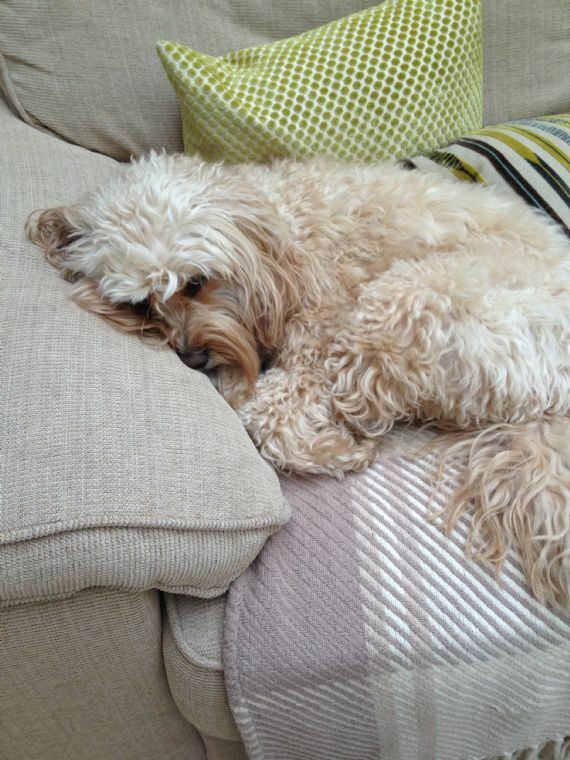 HARD LIFE BEING A COCKAPOO ? 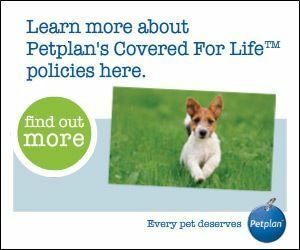 UK AND EUROPEAN COURIER SERVICE AVAILABLE. 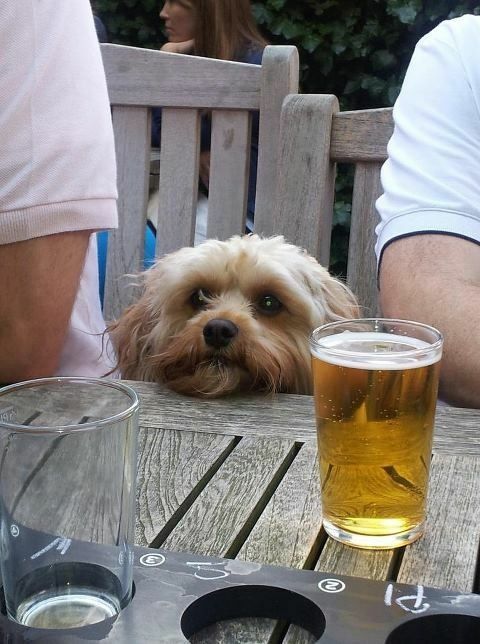 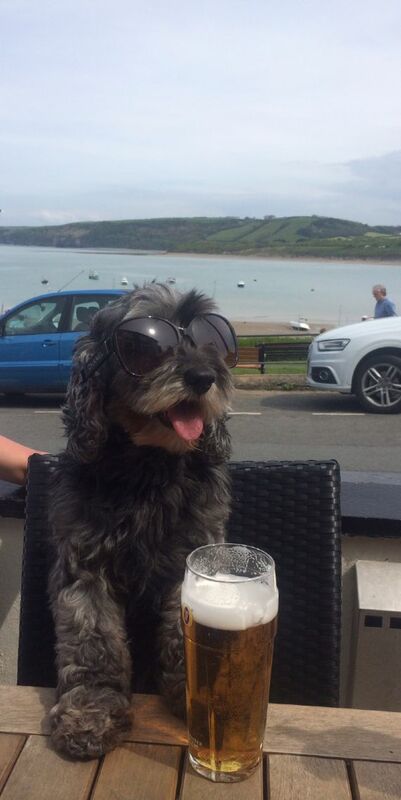 RING ME ON 01545560641 FOR FREE ADVISE ..
UP FOR A PINT ? 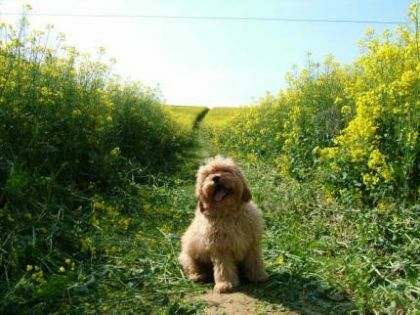 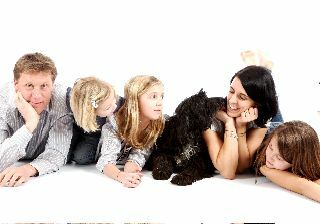 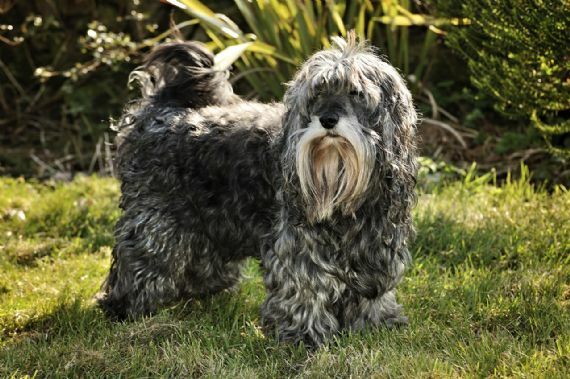 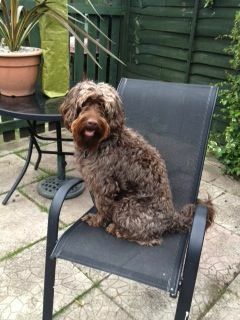 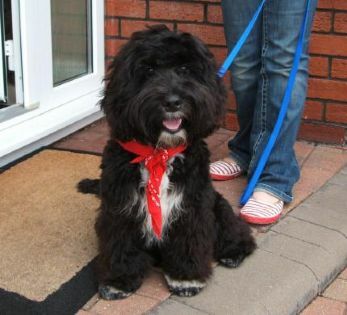 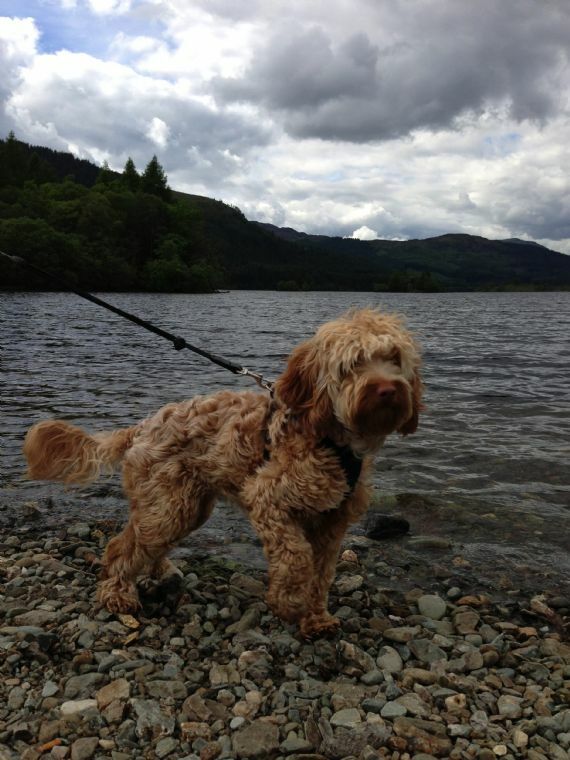 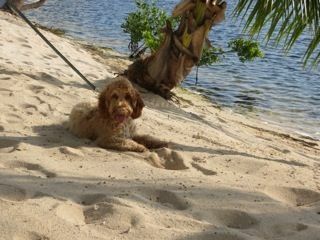 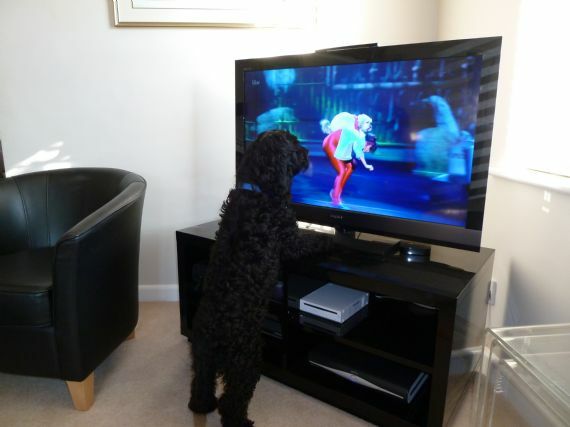 WE FEED WWW.ROYALCANIN.CO.UK DOG FOOD IT IS SIMPLY THE BEST ! 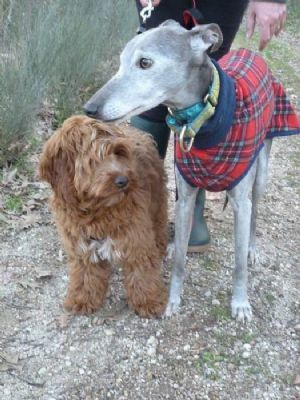 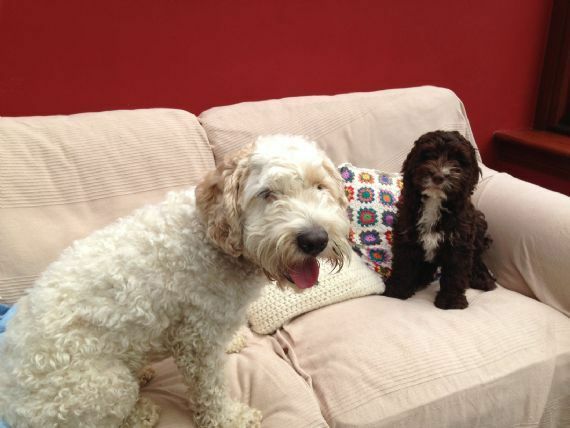 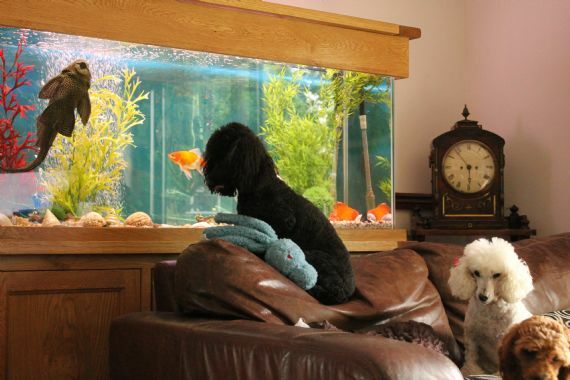 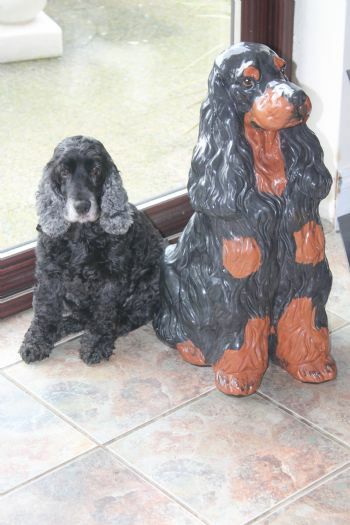 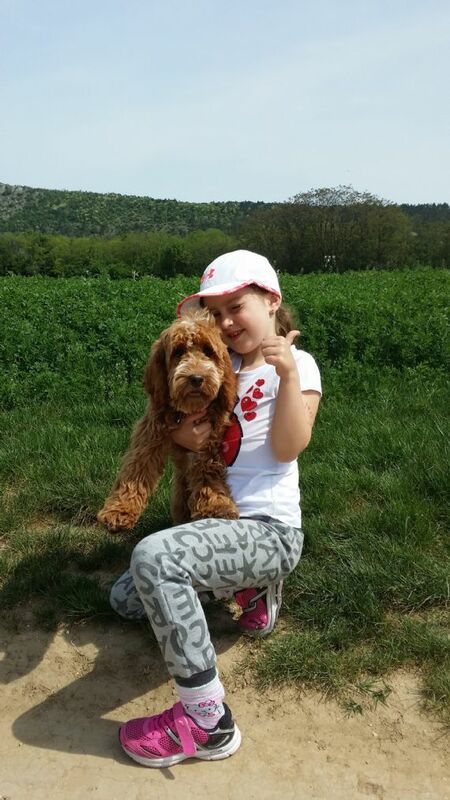 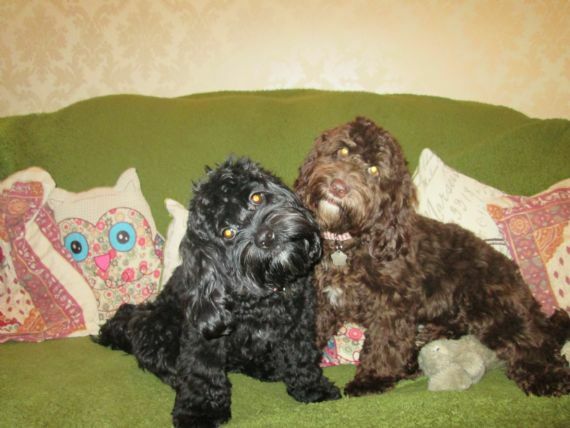 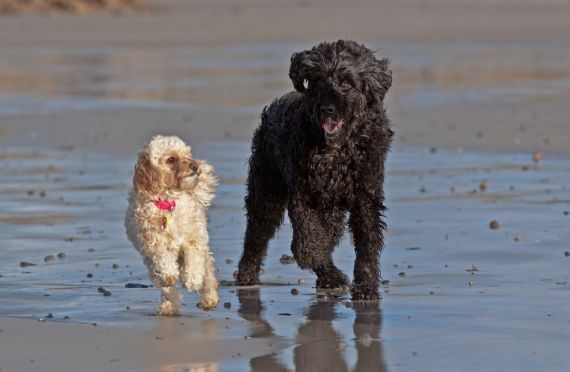 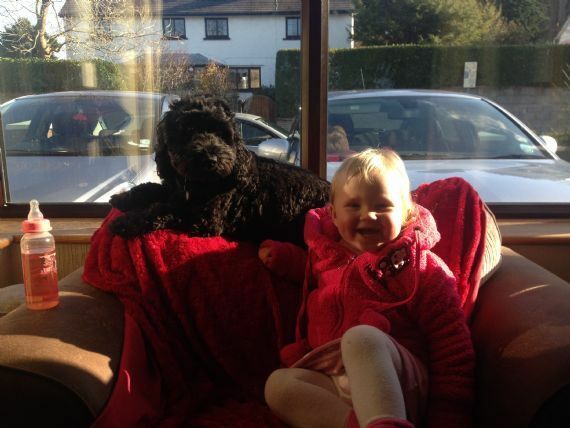 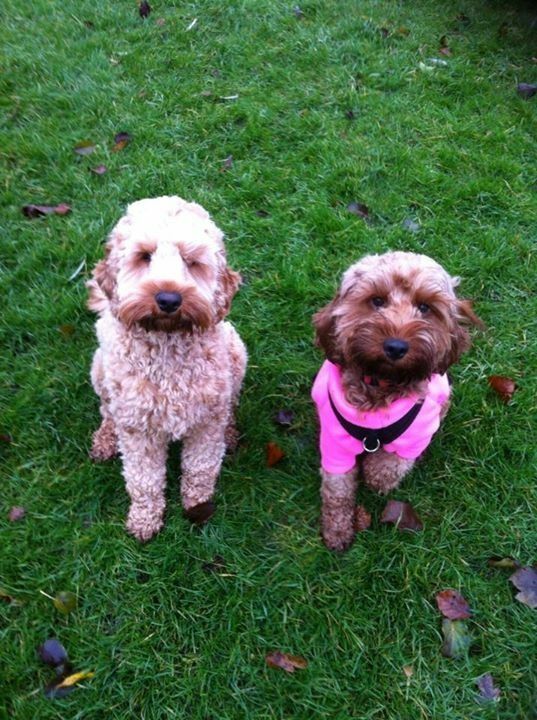 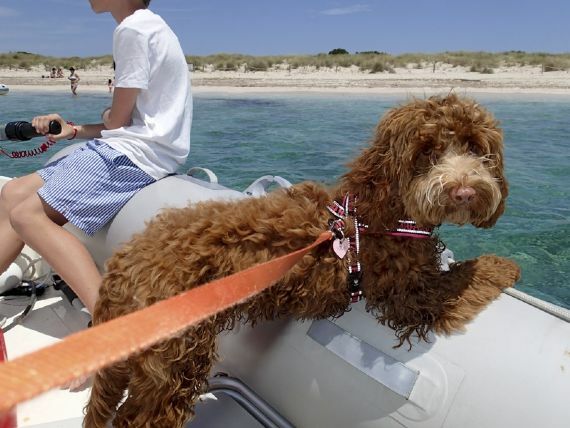 ROSIE IN JERSEY WITH HER PAL PORTUGESE WATER DOG . 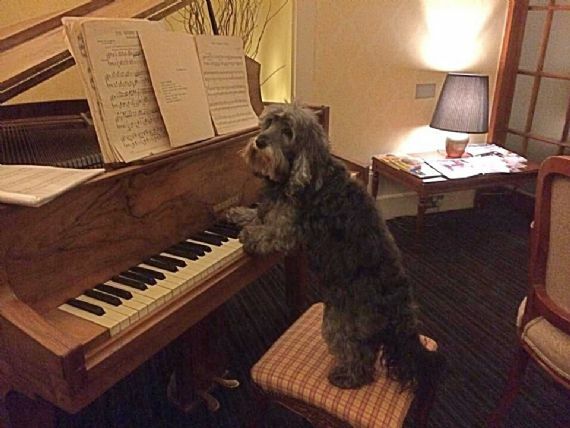 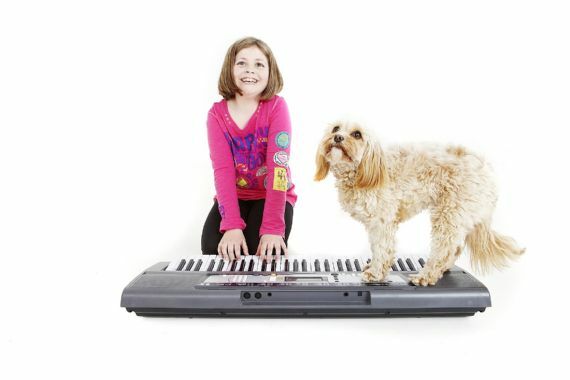 JAZZ BELONGS TO LARA STORMONTH ANOTHER PUDSEY 2 ? 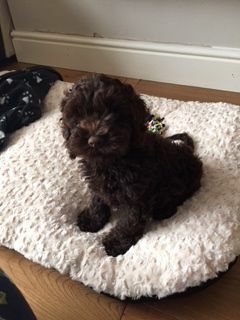 Thought I would give you an update of our gorgeous girl, Doris. 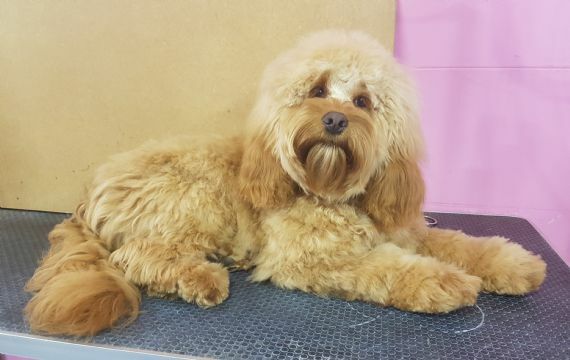 She got groomed on Saturday and looked like cinderella all dressed up for the ball - ddn't take her long to get her scruffy look back again:-) We take her out with us often and almost everyone who passes her either stops to talk to her or makes a comment on how lovely/cute she looks - she loves all the attention. 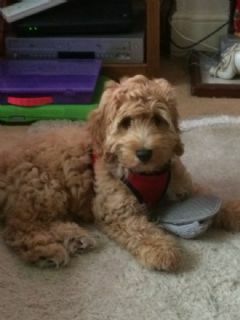 She really is a delight to our family and has settled in very well and seems to enjoy the Cayman sunshine - she made us laugh last week when it was raining one morning, and she stood at the door and looked outside as if to say "you expect me to go out in that?" 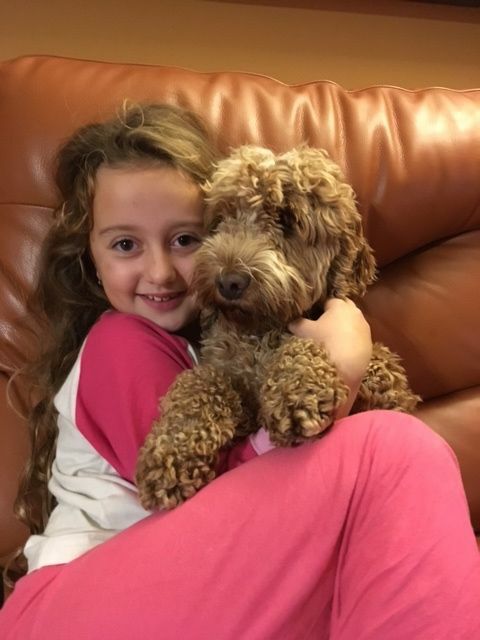 She is very happy and friendly with everyone she meets - she goes to a doggie day care two mornings a week and loves it - she has made lots of doggie friends and is a star with the girls who run the place. 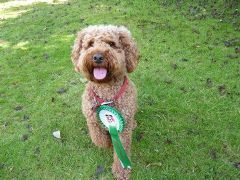 Milo's popularity goes from strength to strength. 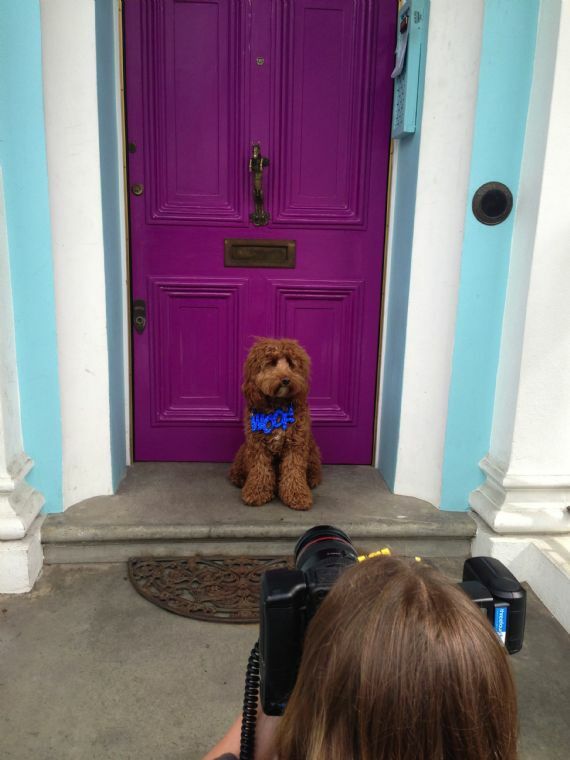 We've done another photoshoot today - it's a front cover picture for Boden - a clothing catalogue. 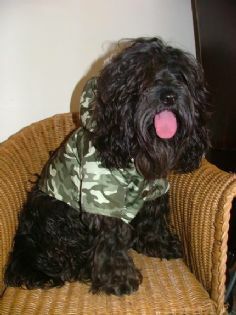 High end clothes and is sold all over the world! 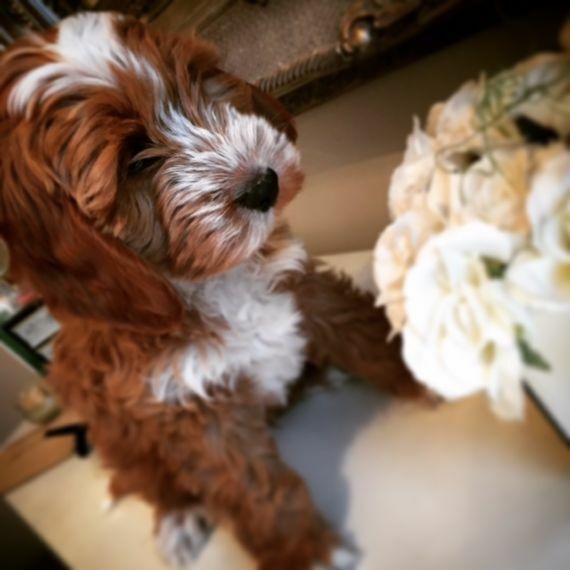 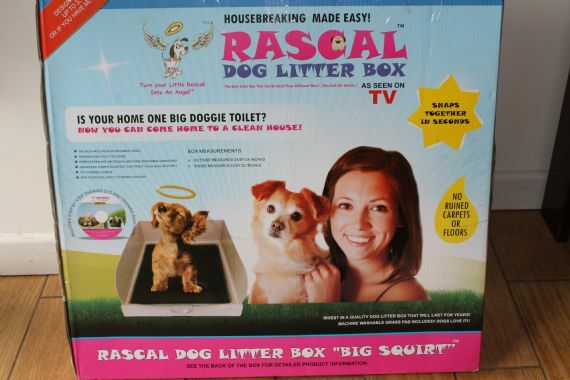 Hollywood stars buy lots of his brand so Milo has officially gone global. 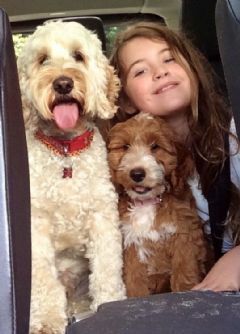 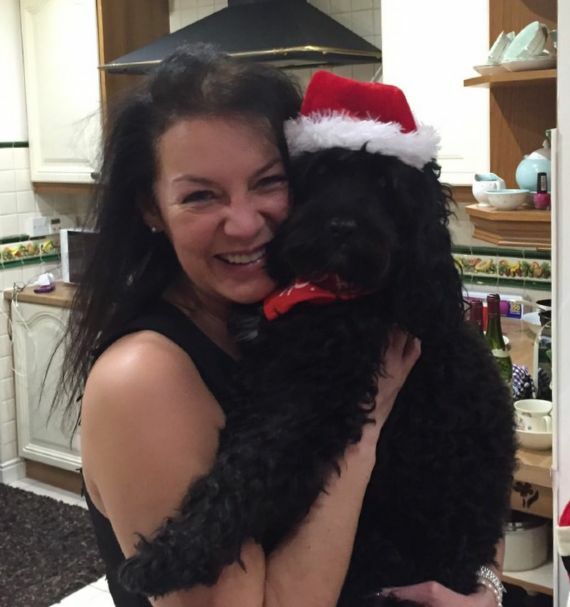 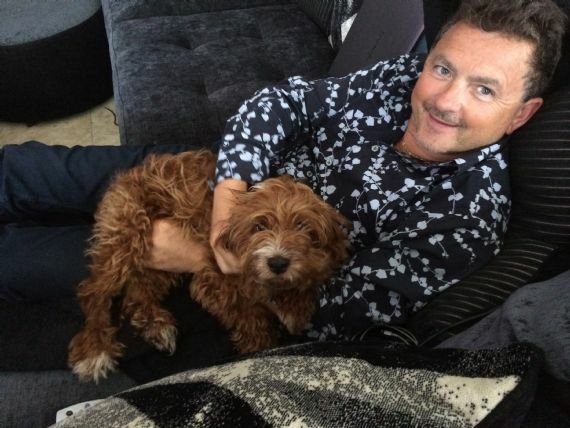 My guest book is available by clicking here.www.jandaz.info please read the emails I have received as references from happy families who have adopted one of my babies WORLD WIDE.. PLEASE NOTE: ALL DOGS AND PUPPIES PICTURED ON MY WEBSITE ARE BRED HERE AT JANDAZ ,PLEASE DO NOT USE ANY PICTURES WITH OUT PERMISSION . My guest book is available by clicking here. 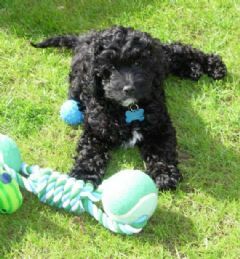 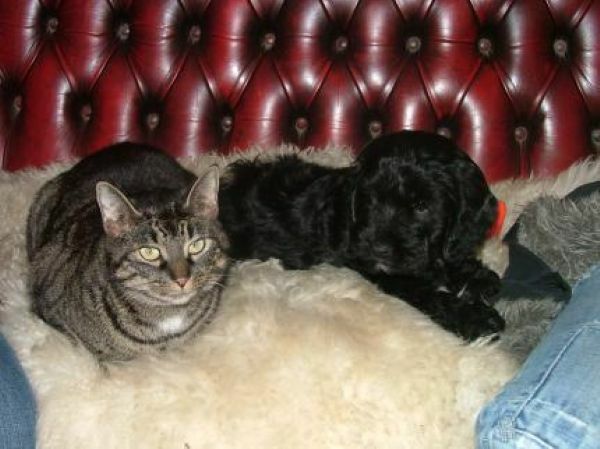 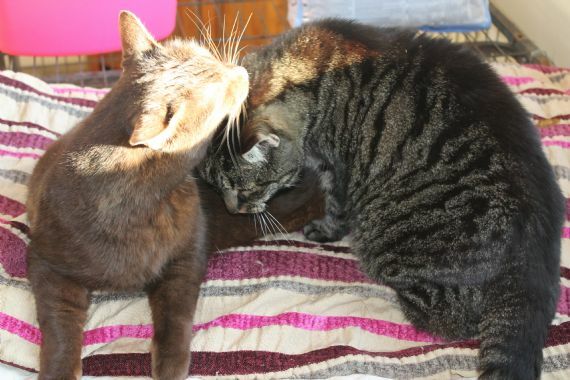 Please read the emails I have received as references from happy families who have adopted one of my babies. 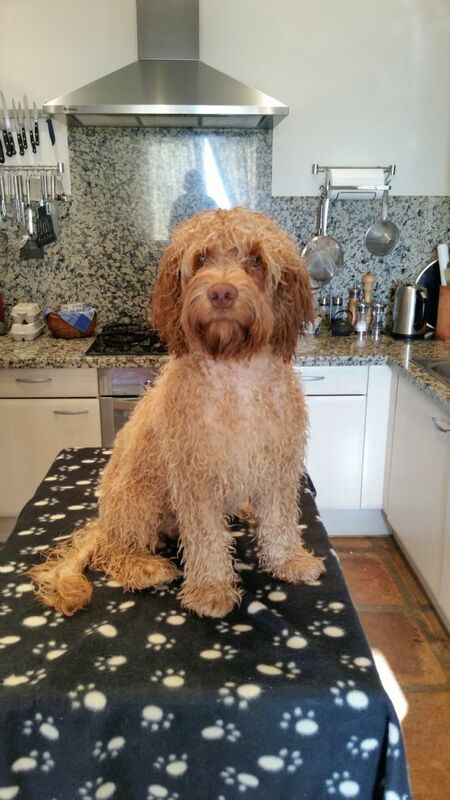 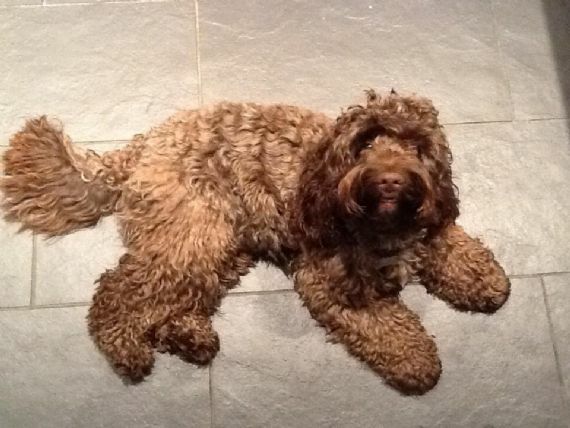 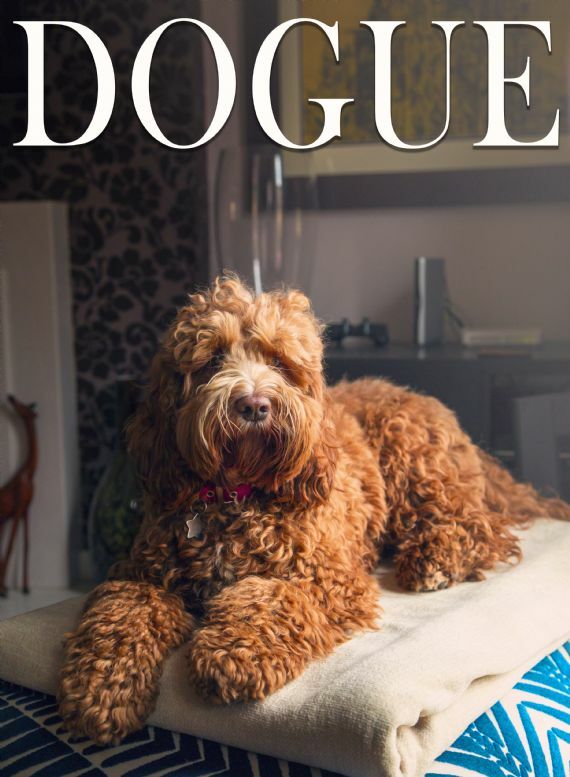 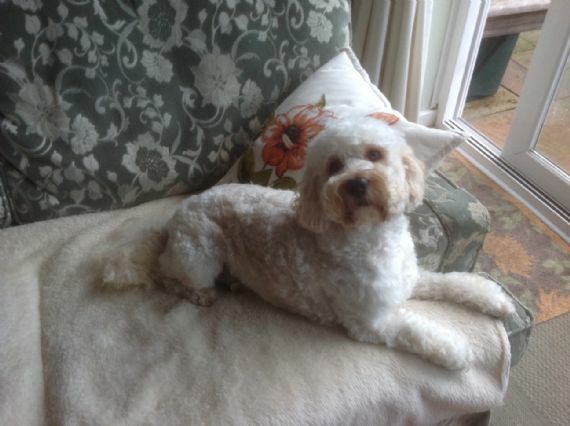 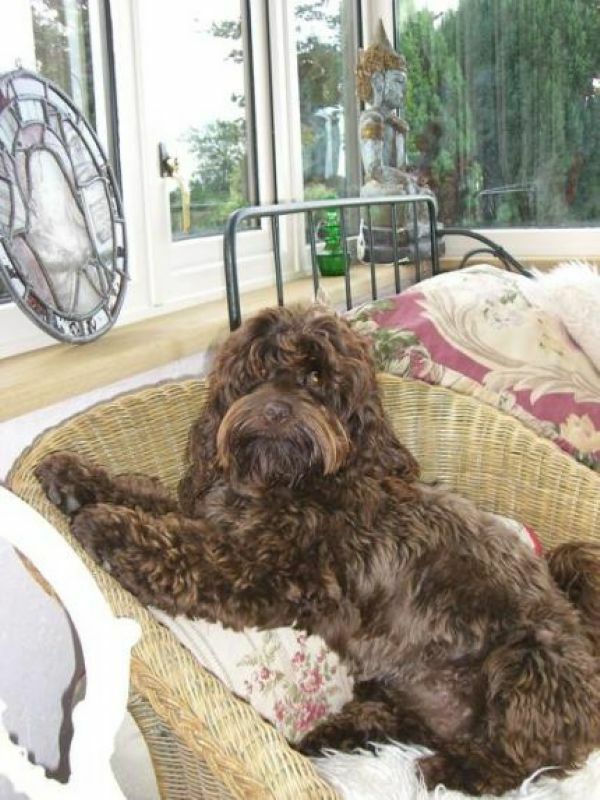 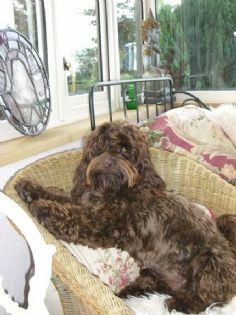 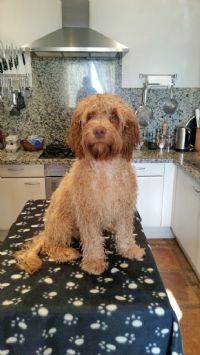 The COCKAPOO of any variety is the most intelligent dog in the world And to top it non moulting no doggy odour and utterly devoted to there owners including the smallest of children,Well after all that if you are ever so lucky as to be owned ! 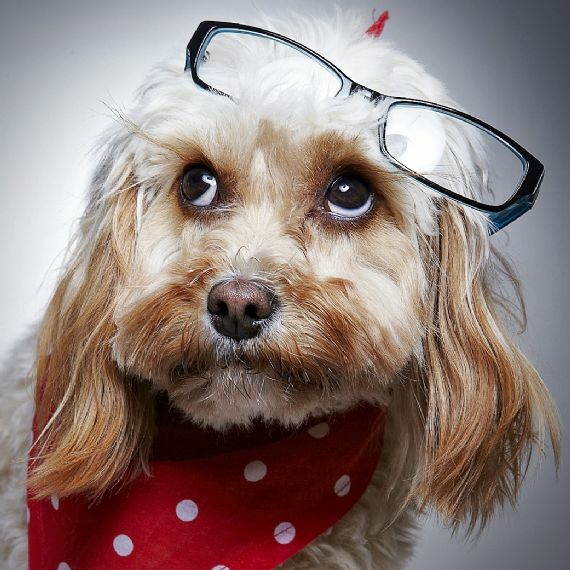 !by this intellectual breed well done !! 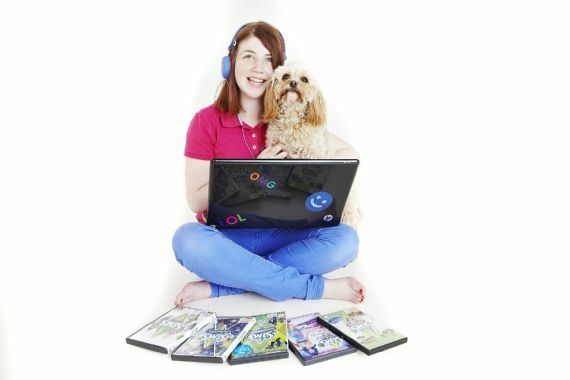 Hope you like my website?? 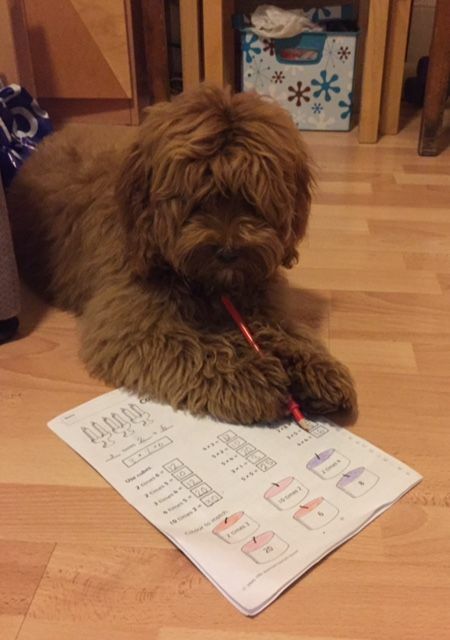 ?please sign the guest book if you do ?